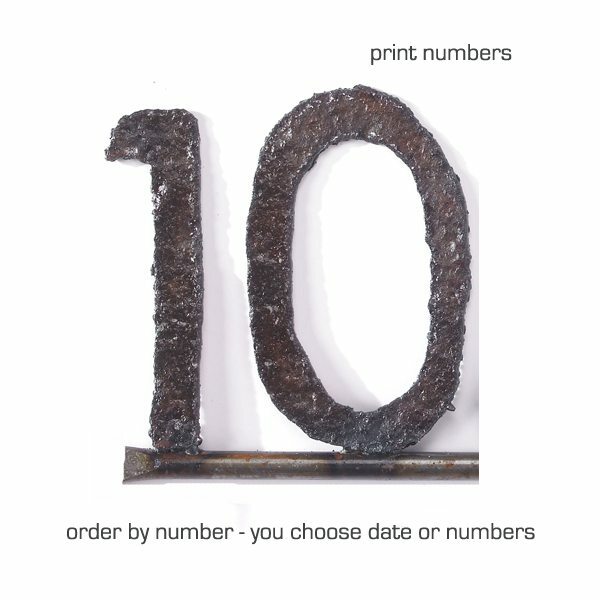 These wonderful date signs are the perfect gift for a birthday, anniversary, or any other significant time of year! 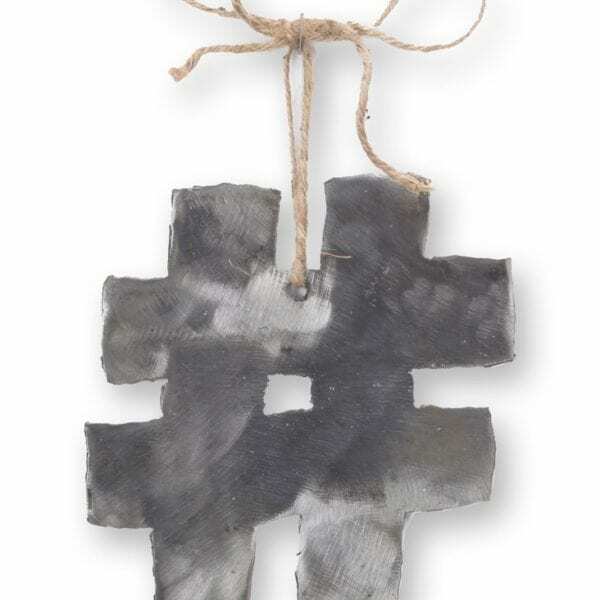 They are made with reclaimed metal. A tribute to the delights of food & eating. 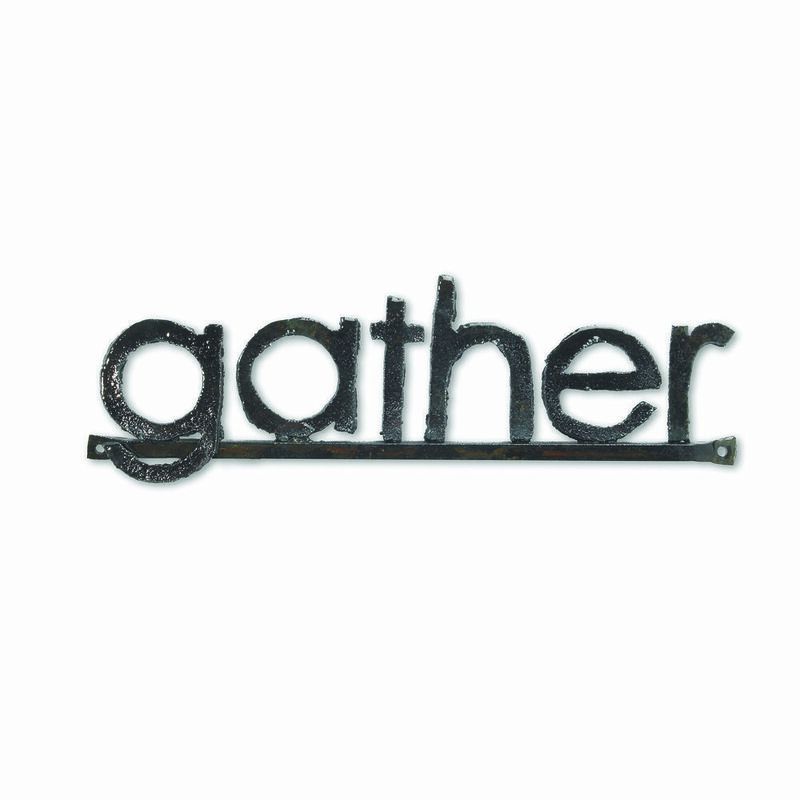 Each sign is hand-cut from reclaimed metal. The pattern is hand drawn on the metal with soapstone and cut with a hand held plasma cutter. 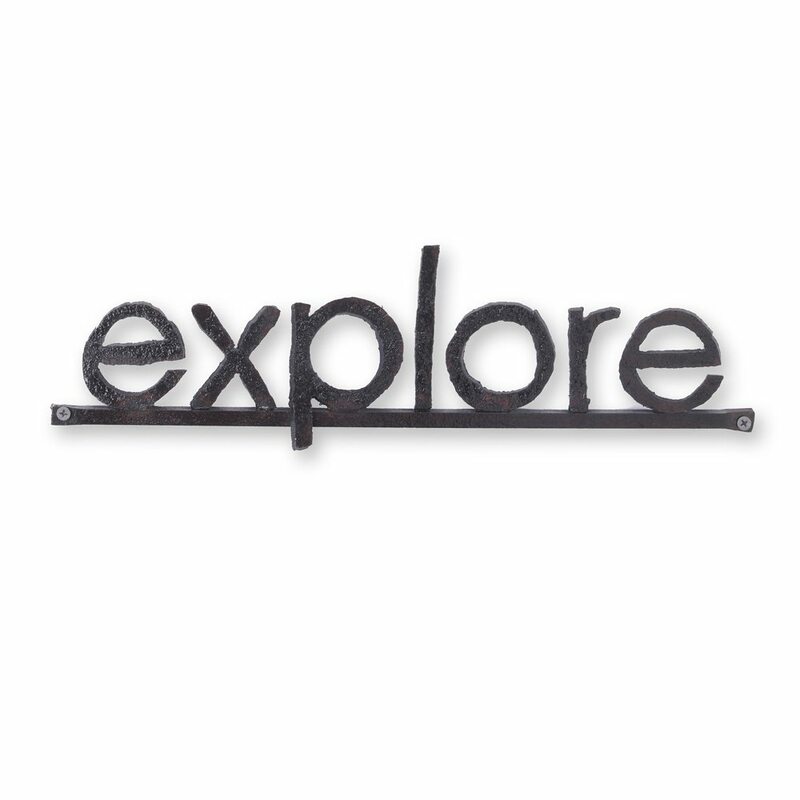 The metal is sealed so you can hang this charming little sign inside or out. The sign is easy to hang with either a nail or screw. Each sign will have very subtle variations. They are cut by hand and each piece of rusty metal has slight color differences. 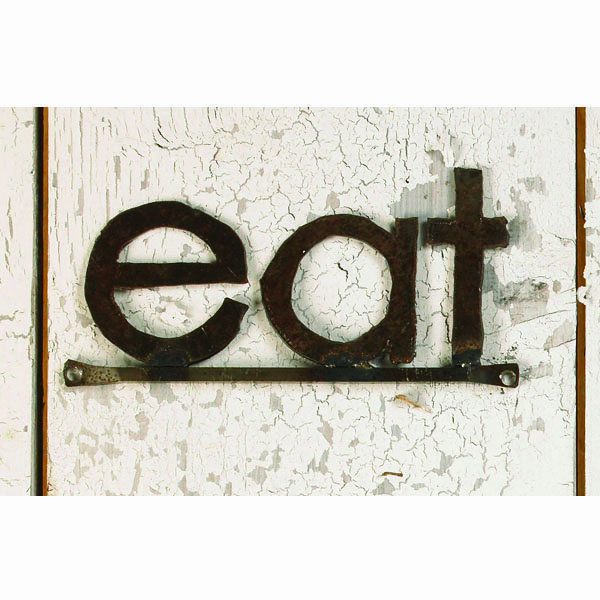 This sign makes a perfect gift for a foodie or farm lover. Size: 8 inches wide by 4” high. 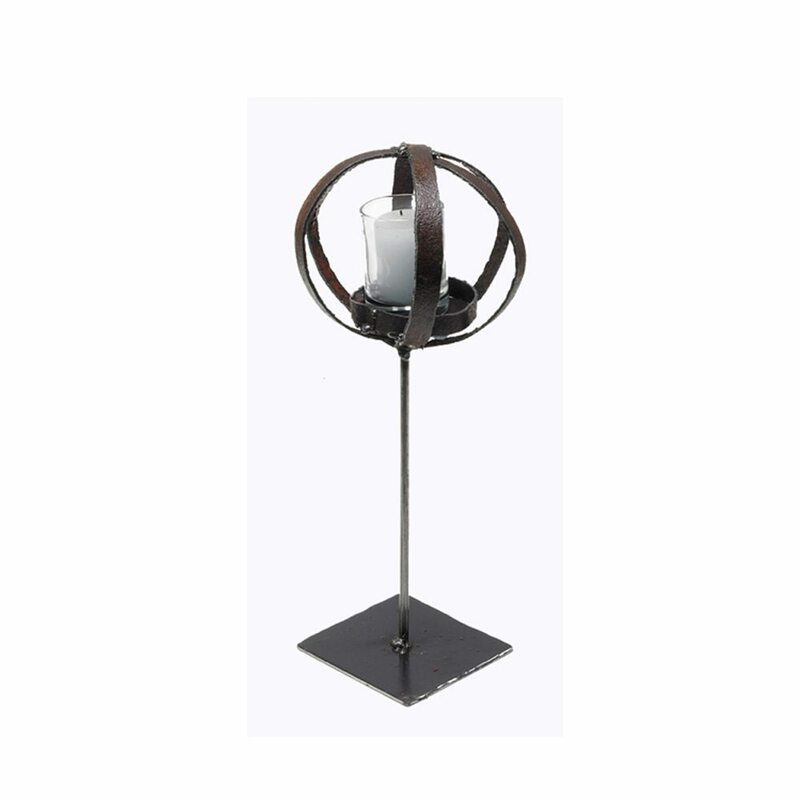 Set your farm table with these elegant, primitive candles stands. 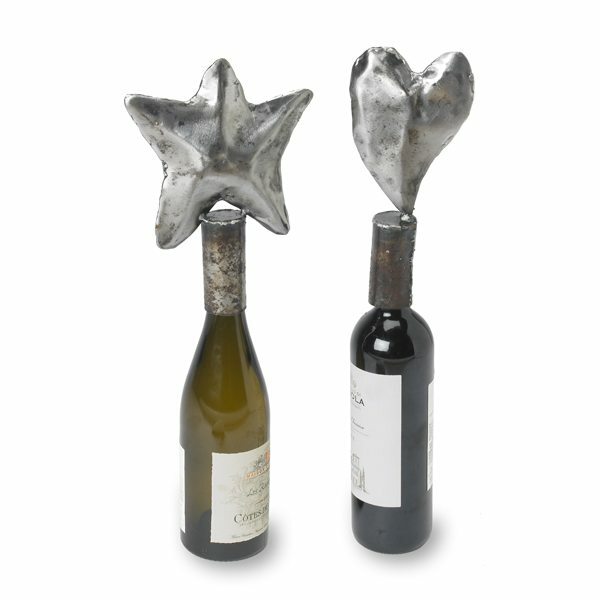 They are handmade with reclaimed metal. 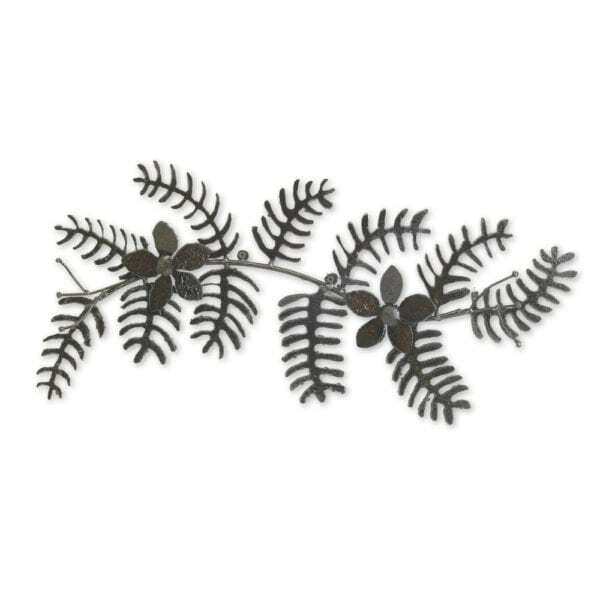 The pattern is hand drawn on the metal with soapstone and cut with a hand held plasma cutter. They are then welded into shape. 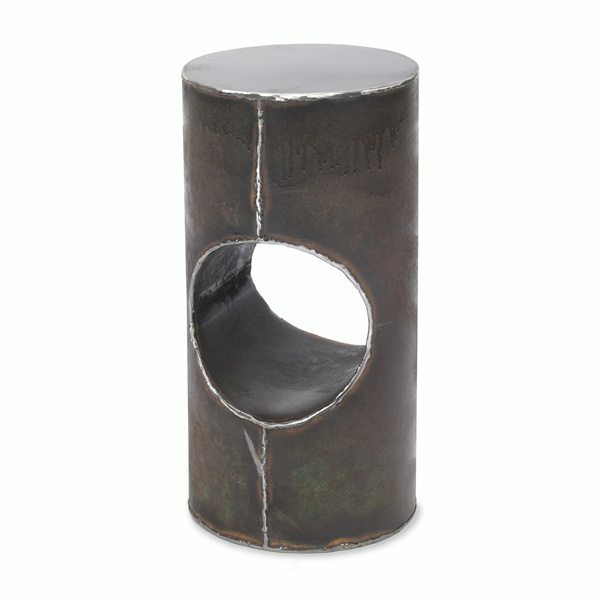 The metal is sealed so you can place these candler holders inside or out. They are cut by hand and each candle stand will have very subtle variations. Price is for one candle lantern, and does not include candle. 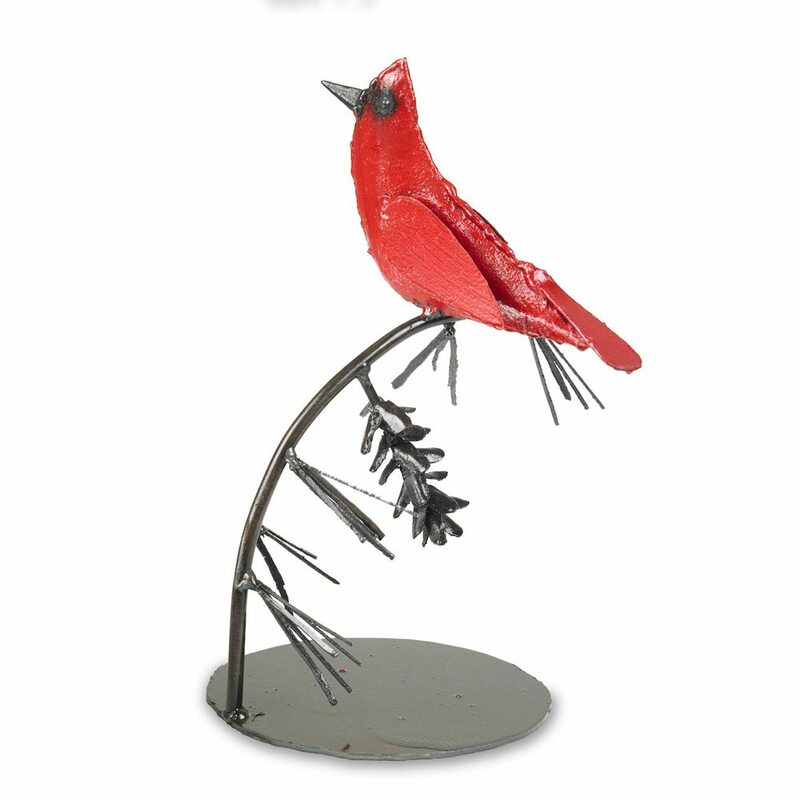 Make a striking statement by adding this cardinal table sculpture to your winter setting. 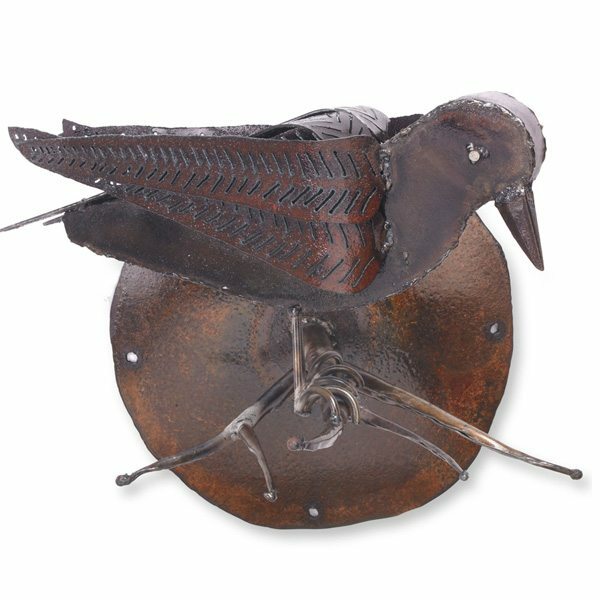 This piece is created with reclaimed metal. We hand draw the pattern on the metal with soapstone and cut it with a hand held plasma cutter. Next we weld the shapes together to form the bird shape. 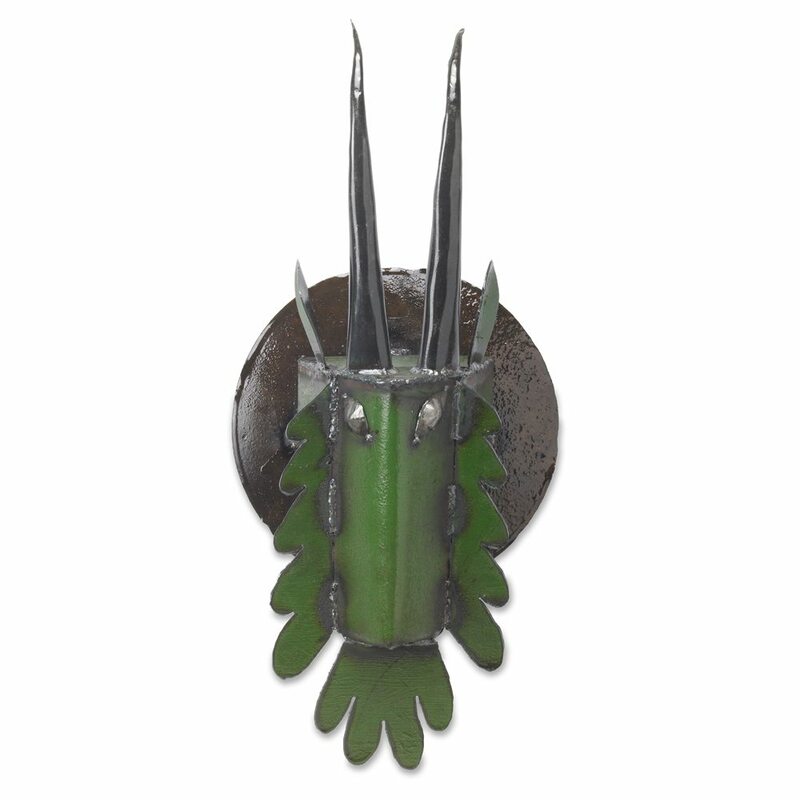 And, the pine cone and pine needles are cut and welded on individually. 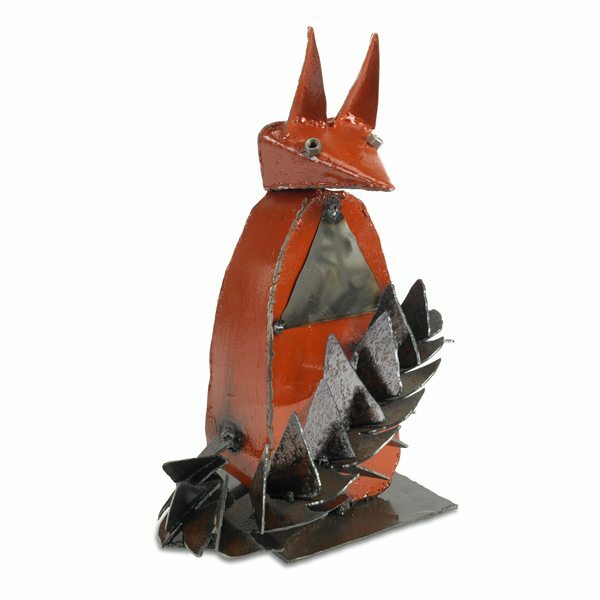 We paint the bird with all natural milk paint. 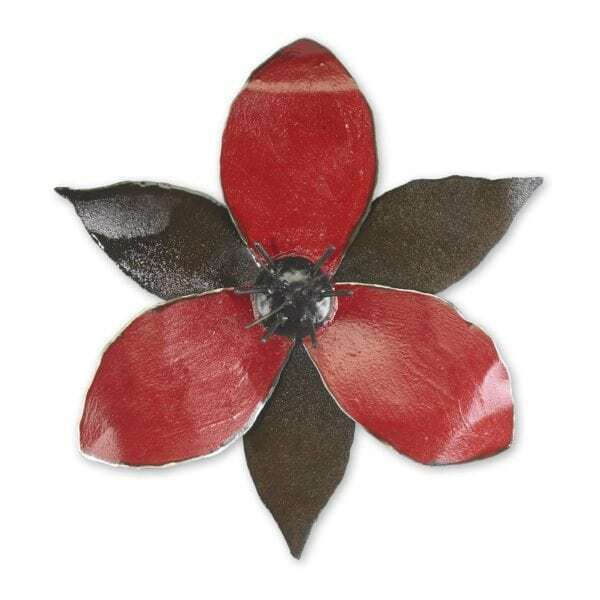 The metal is sealed with a water-based enamel. This piece can be hung inside or out. Each head will have subtle variations. This head can easily be hung with a nail or screw. 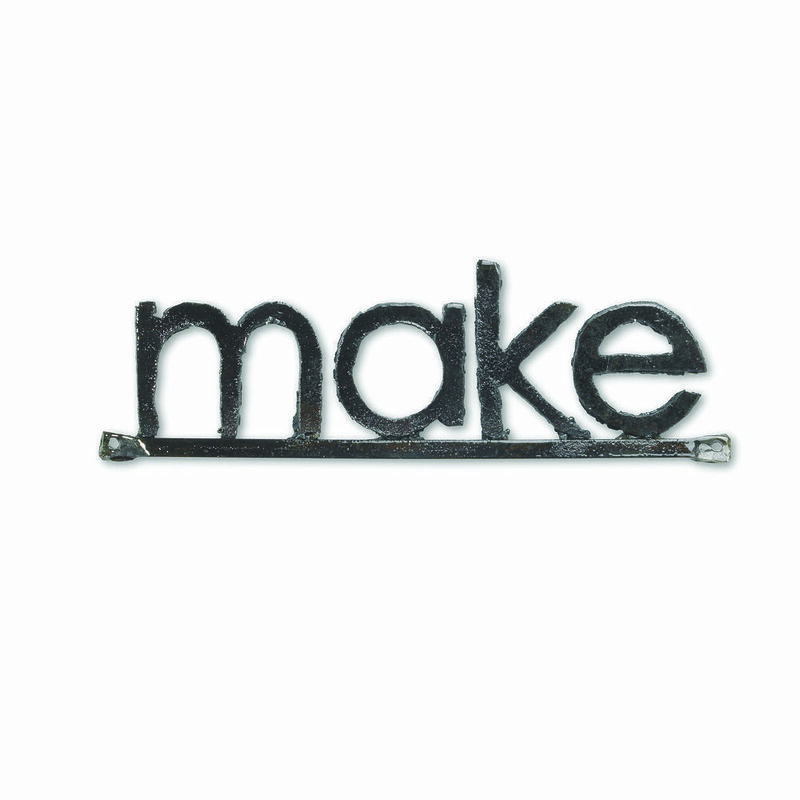 Each letter is hand-cut from reclaimed metal. The rusty metal we use for the sign is from weathered steel. The pattern is hand drawn on the metal with soapstone and cut with a hand held plasma cutter. The metal is sealed so you can hang your letter inside or out. 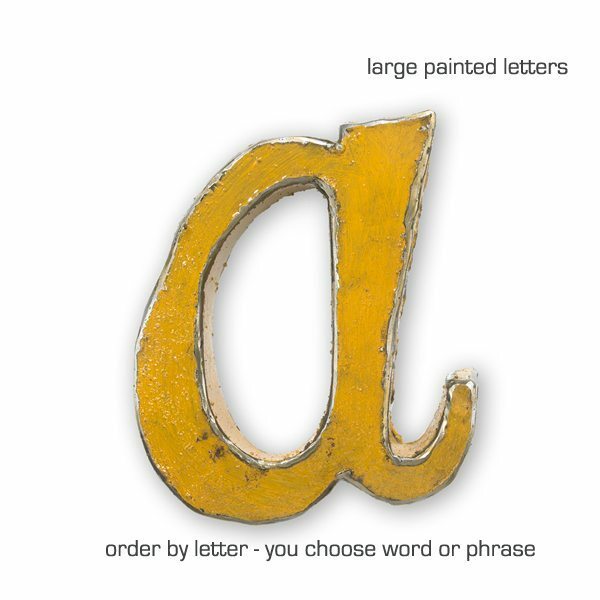 Each letter will have very subtle variations. They are cut by hand and each piece of rusty metal has slight color differences. 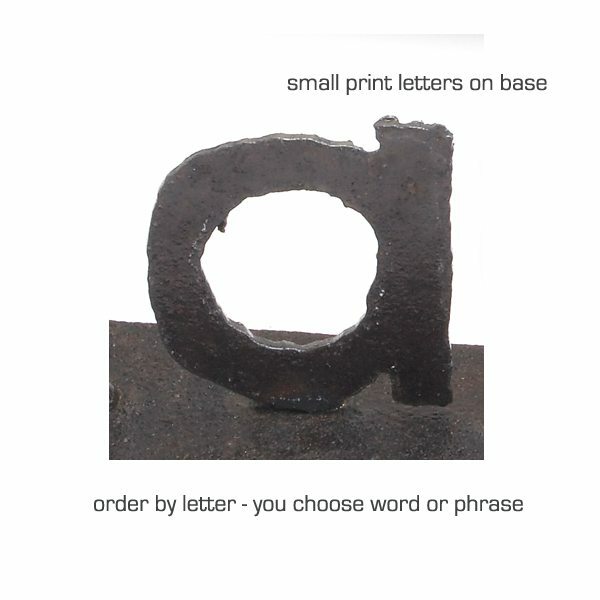 Please let us know what letter you would like in the "order notes" when you checkout. Care: Wipe clean with a damp cloth. If outdoors, you can maintain a shiny metal look [entirely optional] by applying a clear metal enamel, available in a spray can at your local hardware store. 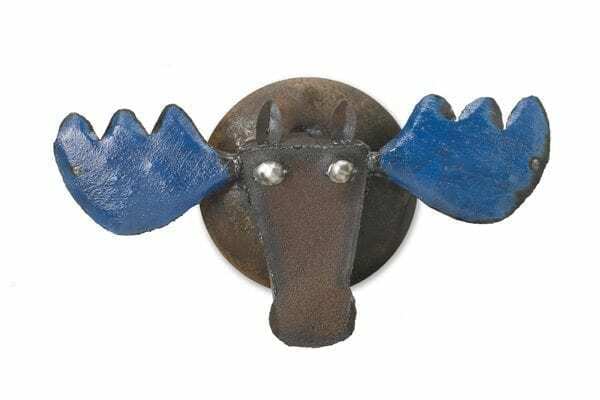 Size: 3.5" high and widths vary from 5-6"
Our “Moose in the Woods” wall scupture is made with reclaimed metal and wood. We hand draw the pattern on the metal with soapstone and cut it with a hand held plasma cutter. We then hammer and weld the head into shape. Finally, we attach it to a reclaimed corn planter disk. We cut the horns from a large block of wood and shape them by hand. 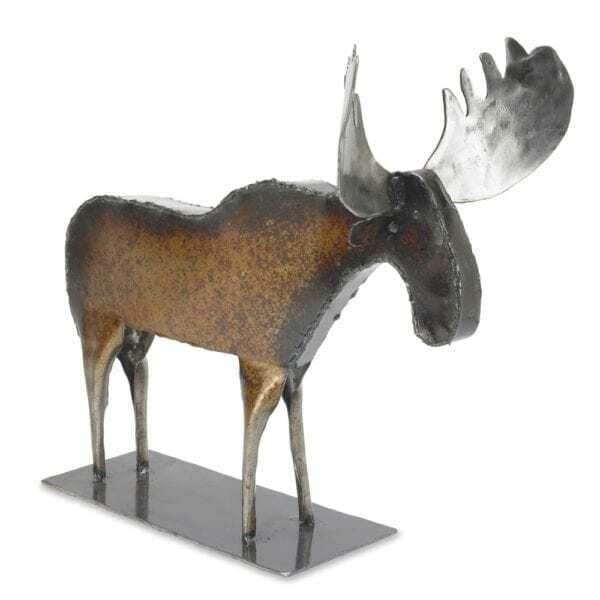 This moose sculpture is handmade with reclaimed metal. We hand draw the pattern on the metal with soapstone and cut it with a hand held plasma cutter. We then hand hammer and weld it into shape. 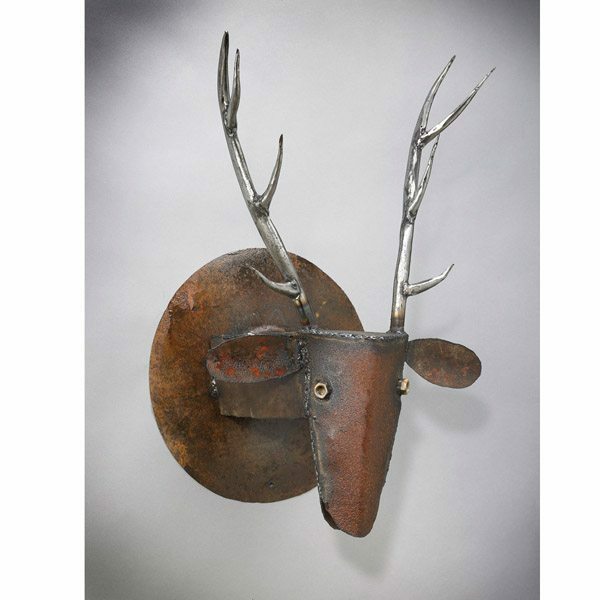 We created this Deer Head sculpture with reclaimed metal. 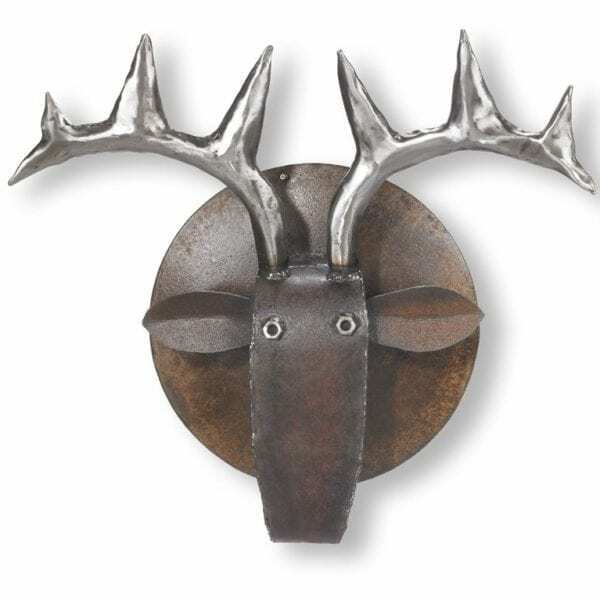 The antlers start out as flat pieces of rusty metal. We hand hammer them into shape and ground smooth. We then hand draw the head pattern on the metal with soapstone and cut it with a hand held plasma cutter. Next we weld the shapes together to form the head. Finally we mount the head on a recycled corn planter disk. 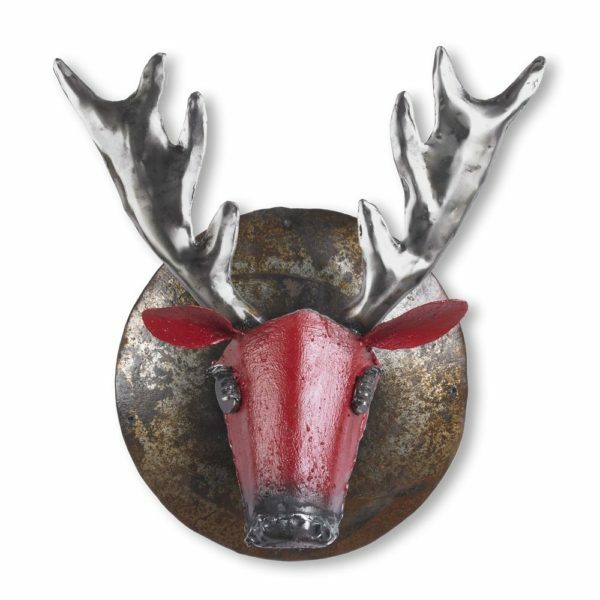 We created this Deer Head entirely from reclaimed metal. The antlers start out as flat pieces of rusty metal. We hand hammer them into shape and grind them smooth. We then hand draw the head pattern on the metal with soapstone and cut it with a hand held plasma cutter. Next we weld the shapes together to form the head. Finally we mount the head on a recycled corn planter disk. 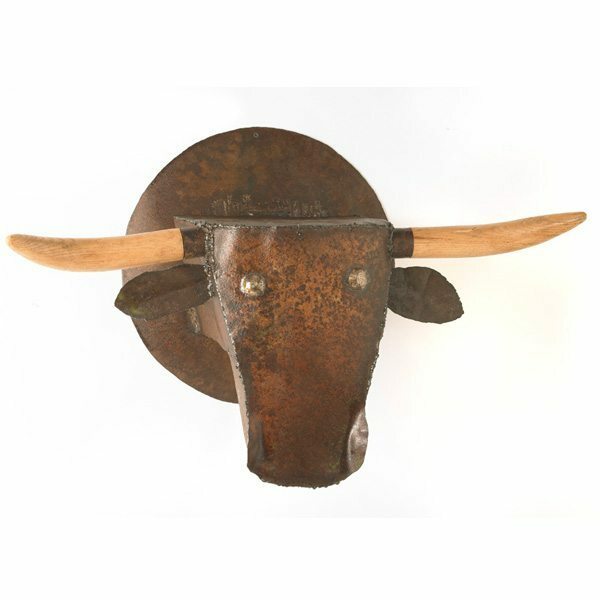 We made this stunning steer head with reclaimed metal and wood. First we hand draw the head pattern on the metal with soapstone and cut it with a hand held plasma cutter. We then hand hammer and weld the shapes together to form the head. Finally we mount the head on a recycled corn planter disk. We cut the horns from a large block of wood and shape them by hand. 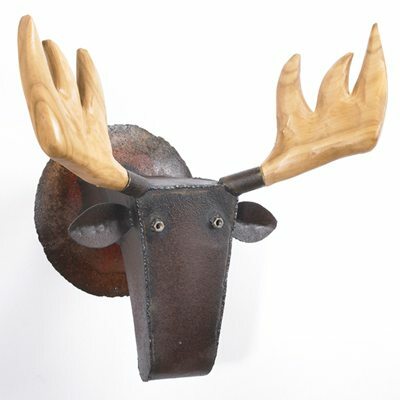 We created this moose head wall sculpture with reclaimed metal. The colors are hand painted with milk paint. We hand draw the pattern on the metal with soapstone and cut it with a hand held plasma cutter. We then hammer and arc weld the moose into shape. The head is mounted on a recycled corn planter disk. 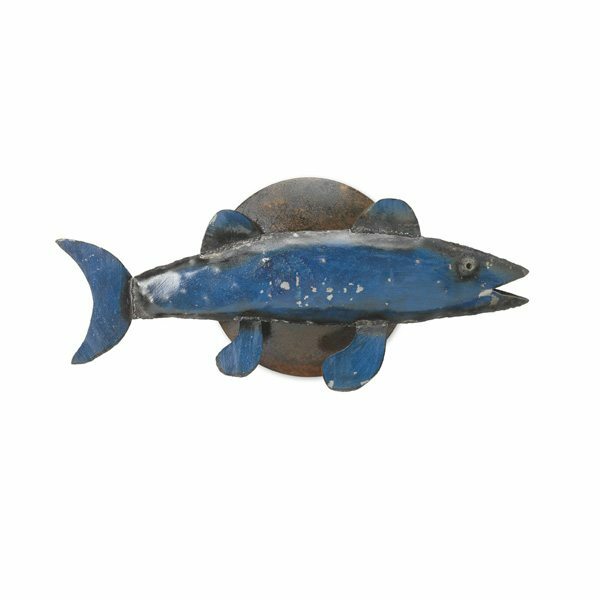 We created this Striped Fish entirely from reclaimed metal. We hand draw the pattern on the metal with soapstone and cut it with a hand held plasma cutter. 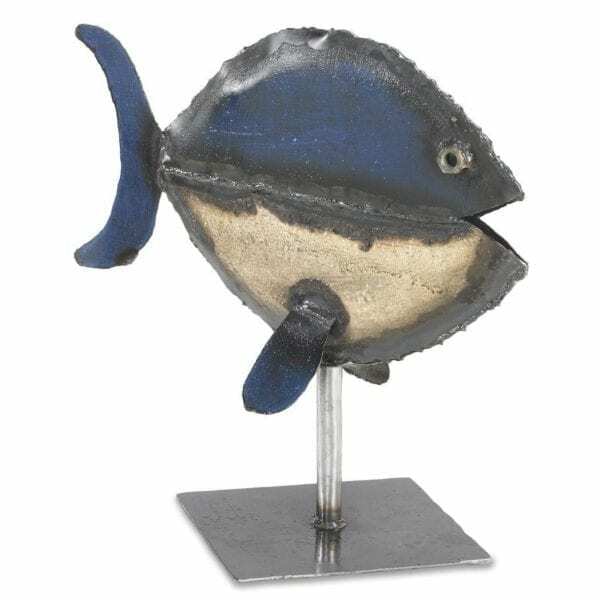 We then hand hammer and arc weld the fish into shape. It is painted with blue milk paint. 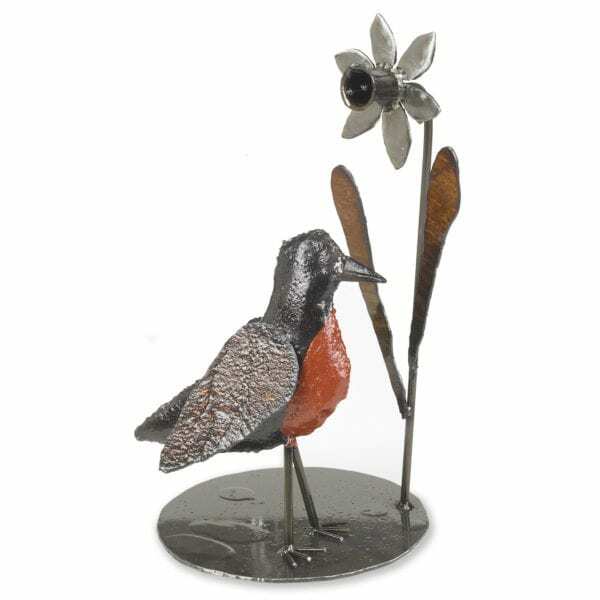 We created this darling Robin and Daffodil sculpture to honor the exciting moment when the first Robin of spring is sighted! 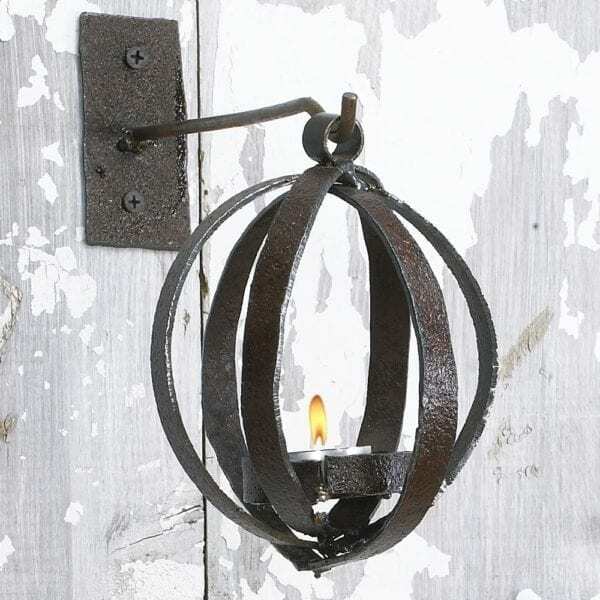 It is handmade in Pennsylvania from reclaimed metal. The pattern is hand drawn on the metal with soapstone and cut with a hand held plasma cutter. The Robin is then hand hammered and arc welded into shape. 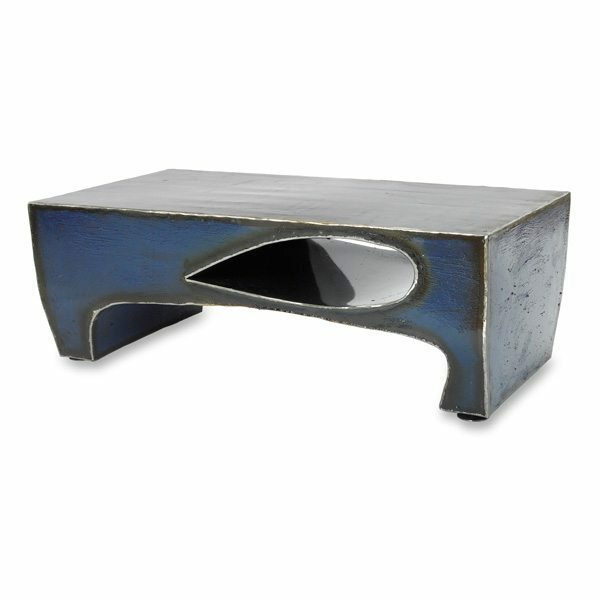 We weld reclaimed sheet metal together to form the base, and use a new piece of US made 11 gauge steel for the top. 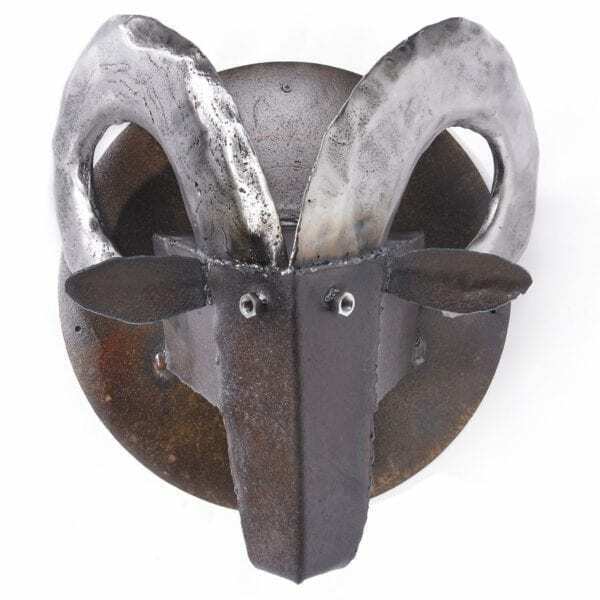 We created this rams head wall sculpture with reclaimed metal. We hand draw the pattern on the metal with soapstone and cut it with a hand held plasma cutter. We then hand hammer and arc weld the rams head into shape. Holiday decor that you can use all year long - can be used for any holiday! 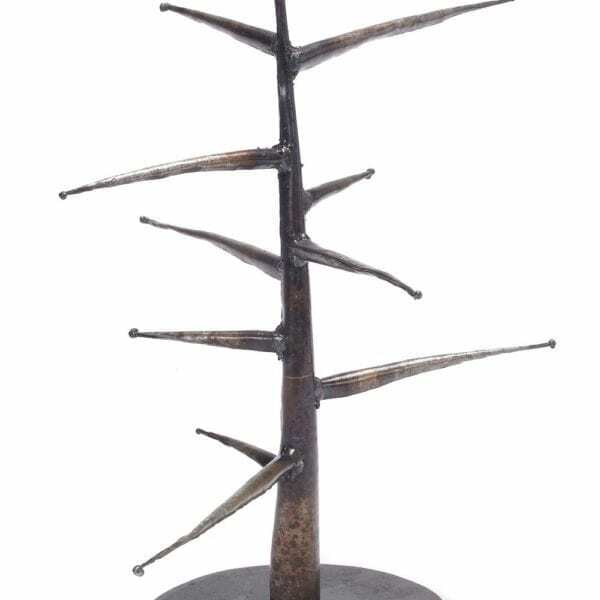 A beautifully modern tree to display your favorite ornaments. 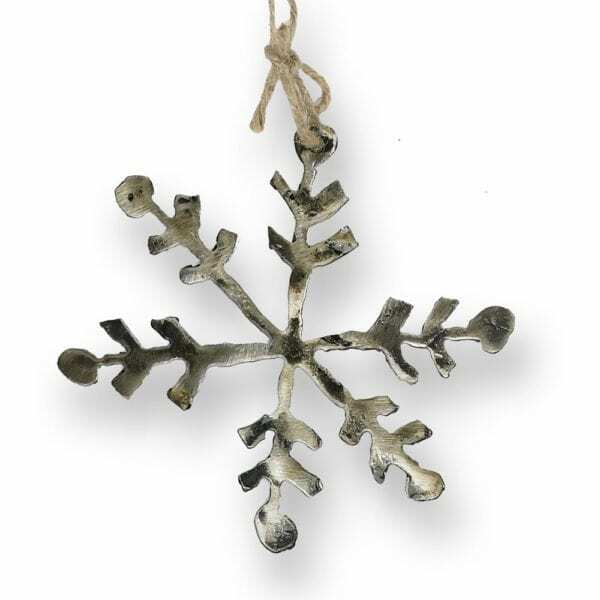 The metal we used is from weathered steel. We hand draw the pattern on the metal with soapstone and cut it with a hand held plasma cutter. We then hand hammer each branch and weld it into shape. 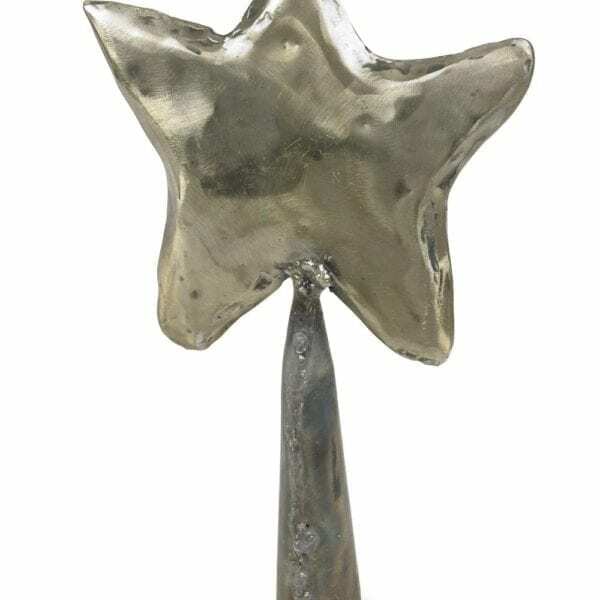 The metal is sealed with a water-based enamel. 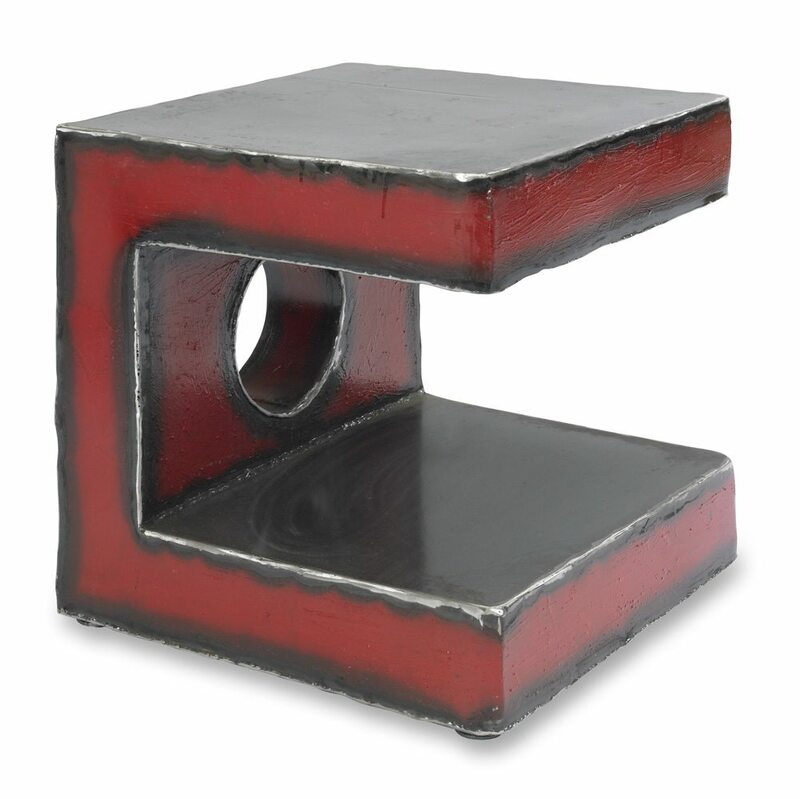 This piece can be placed inside or out. Each tree will have subtle variations. They are cut by hand and each piece of metal has slight color differences. Care: Wipe clean with a damp cloth. If outdoors, you can maintain a shiny metal look [entirely optional] by applying a clear metal enamel, available in a spray can at your local hardware store. 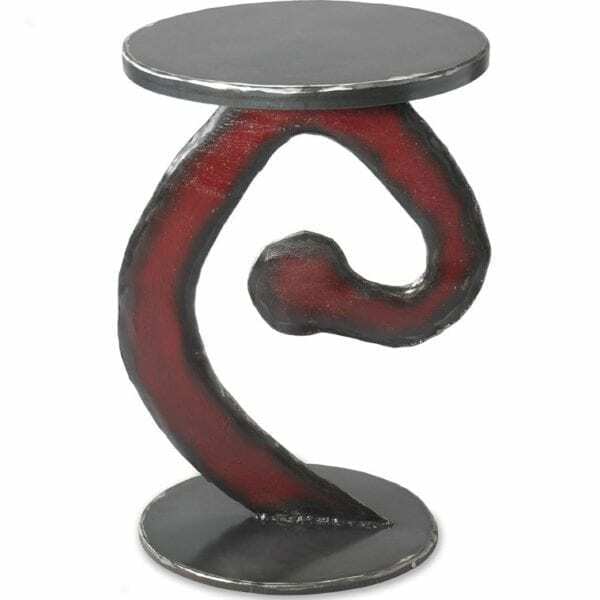 size: 18"h x 14"w x 14"d - The base is an 8" circle. 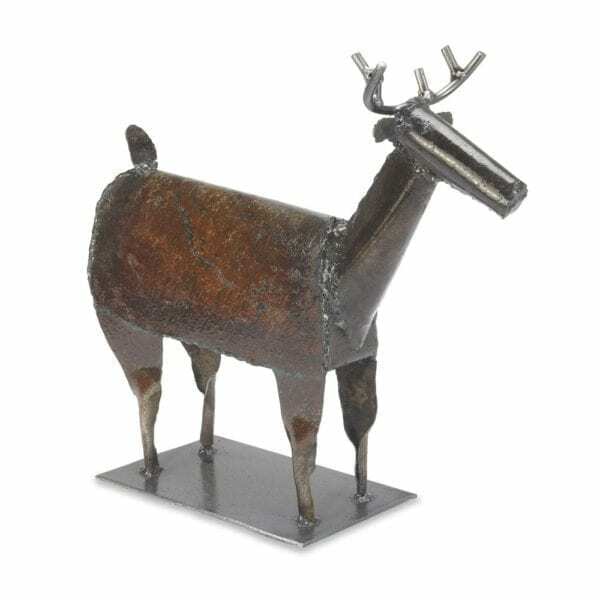 This deer sculpture is a lovely tabletop accent piece. The metal we use is from weathered steel. We hand draw the pattern on the metal with soapstone and cut it with a hand held plasma cutter. We then hand hammer and weld it into shape. 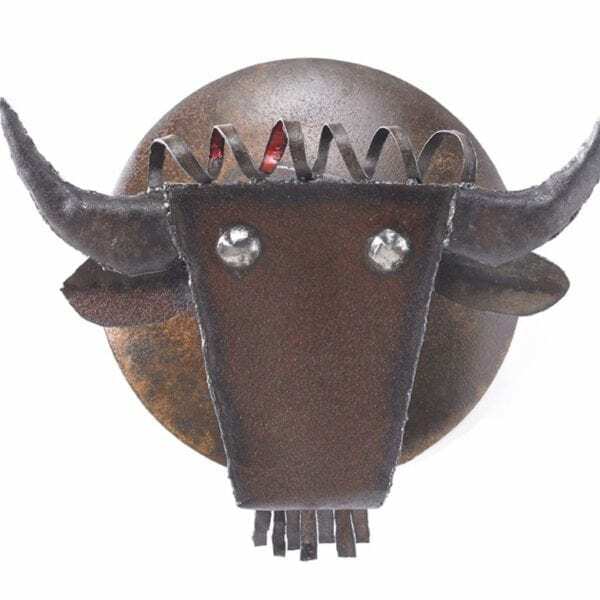 Our buffalo head is handmade with reclaimed metal. We hand draw the head pattern on the metal with soapstone and cut it with a hand held plasma cutter. The shapes are then arc welded together to form the head. 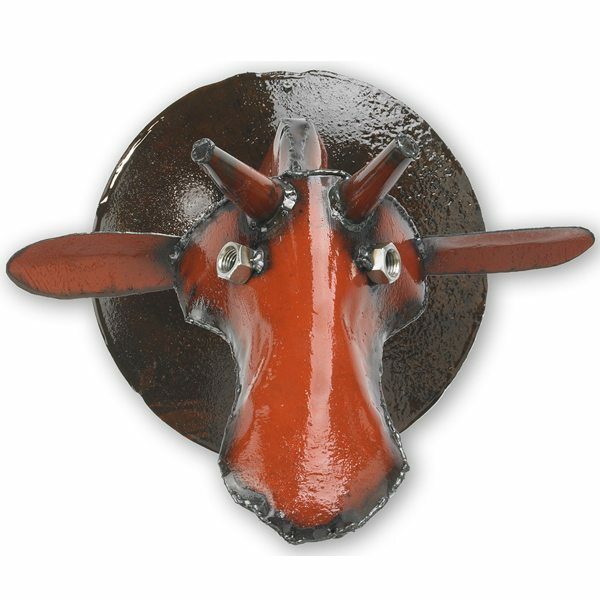 We hand hammer the eyes on and mount the head on a recycled corn planter disk. 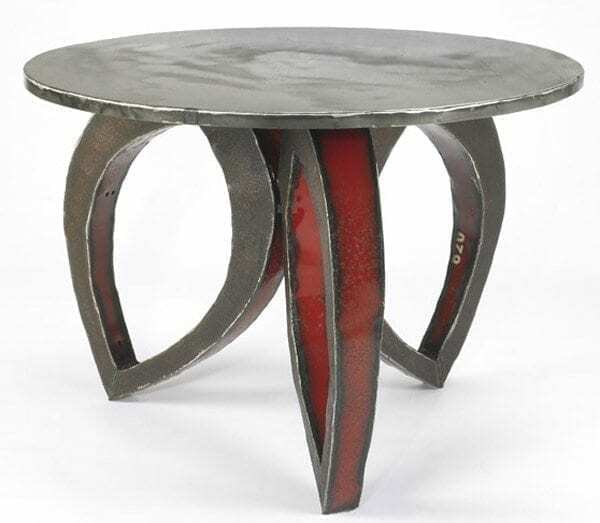 We created this table with reclaimed metal, that we cut and welded into shape. We made the top by hand cutting, planing and sanding reclaimed barn floor boards. 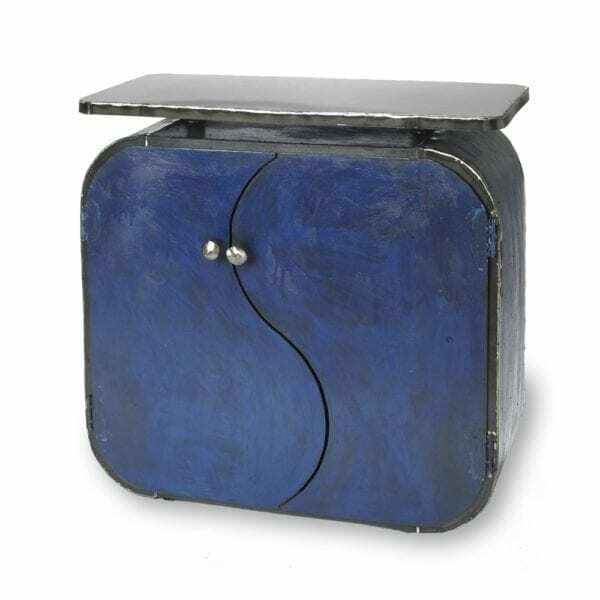 The blue color is hand-painted with real milk paint. I just want to tell you how much I am loving my side table/nightstand. I keep going into the bedroom just to look at it. The barn wood is so beautiful and it fits into my idea of decor, besides being very useful for storage. I just love it. Thank you. 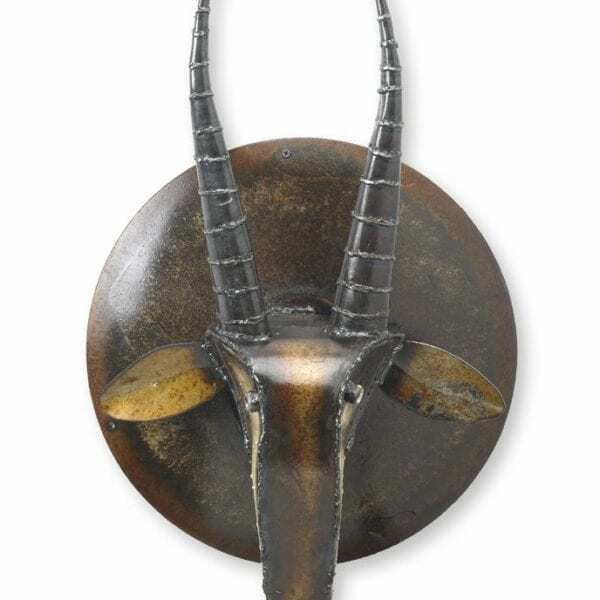 This antelope head is handmade in Pennsylvania. 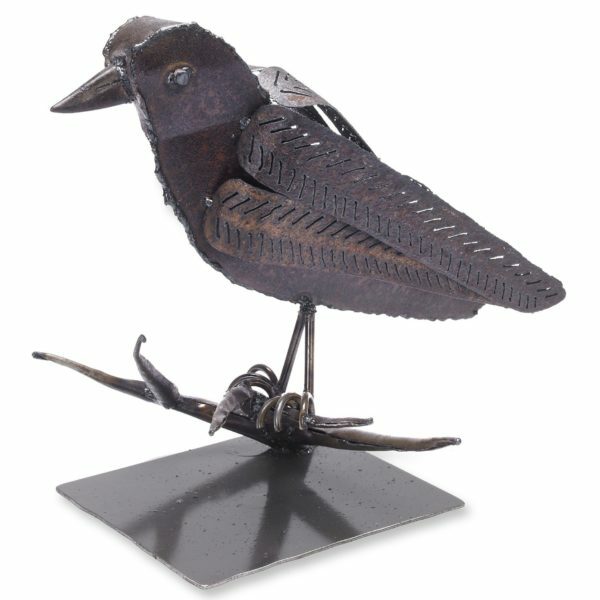 It is created from reclaimed metal. The pattern is hand drawn on the metal with soapstone and cut with a hand held plasma cutter. 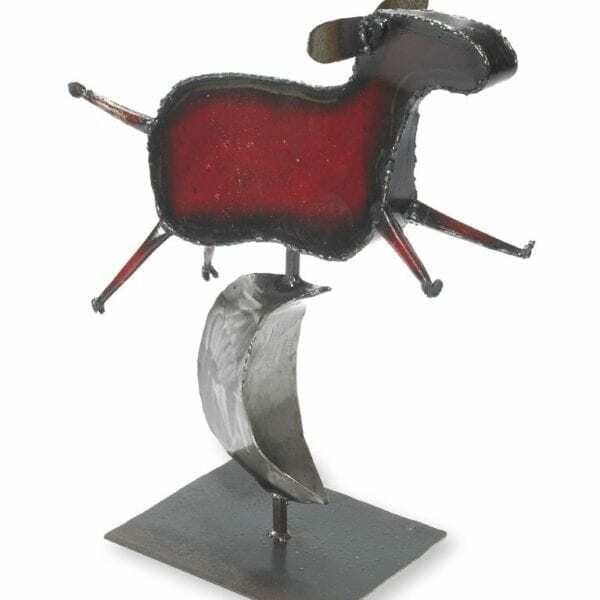 The antelope is then hand hammered and arc welded into shape. Each piece will have subtle variations. They are cut by hand and each piece of metal has slight color differences. 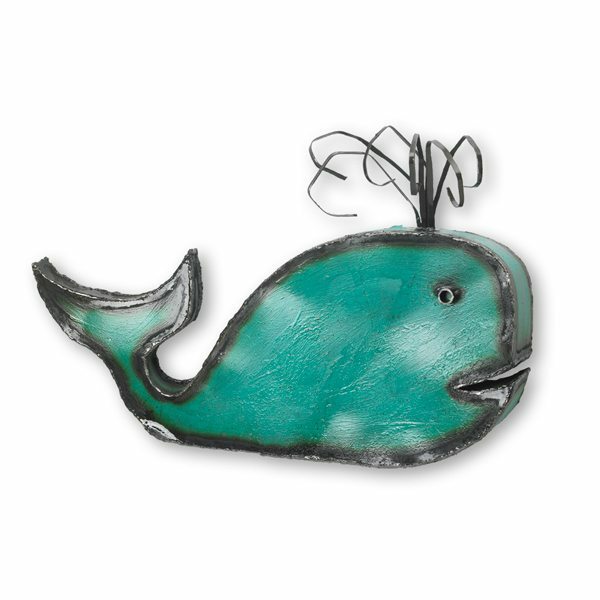 The metal is sealed with a water-based enamel. 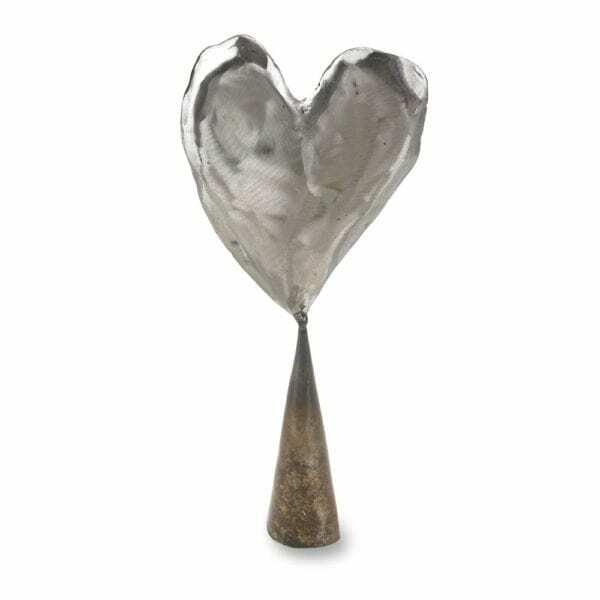 This piece can be placed inside or out. This head can easily be hung with a nail or screw. It weighs approximately 15lbs. 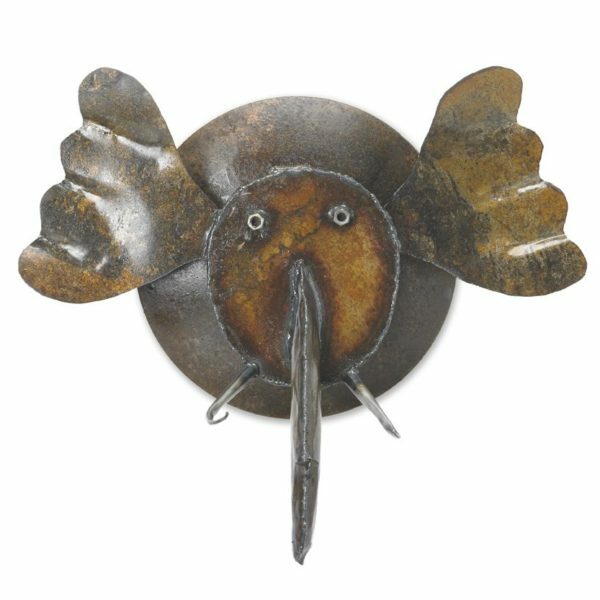 This Tudor Moose sculpture is handmade in Pennsylvania from reclaimed metal. The pattern is hand drawn on the metal with soapstone and cut with a hand held plasma cutter. The Moose is then hand hammered and arc welded into shape. The color is all natural milk paint. Each piece will have subtle variations. They are cut by hand and each piece of metal has slight color differences. The metal is sealed with a clear enamel. 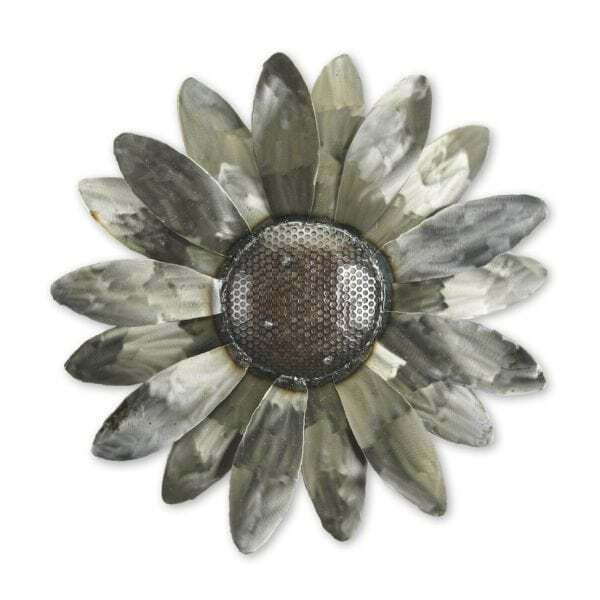 This Wall Sunflower is handmade in Pennsylvania from reclaimed metal. The pattern is hand drawn on the metal with soapstone and cut with a hand held plasma cutter. 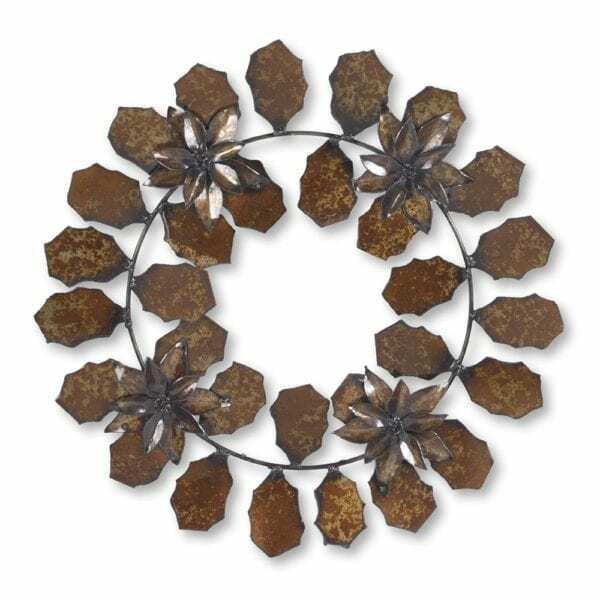 Each petal is hand hammered and arc welded into shape. This Red Trillium (a flower also known as Stinking Benjamin) can be found in the early spring along our driveway. We created this sculpture in honor of it's lovely bloom. 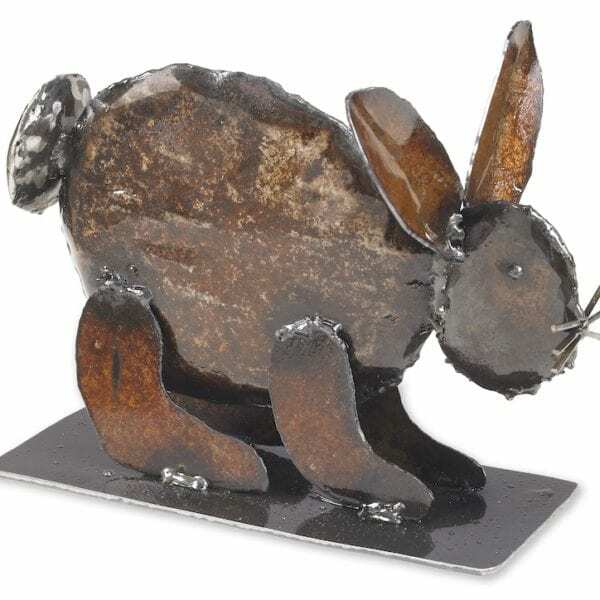 It is handmade from reclaimed metal. The pattern is hand drawn on the metal with soapstone and cut with a hand held plasma cutter. 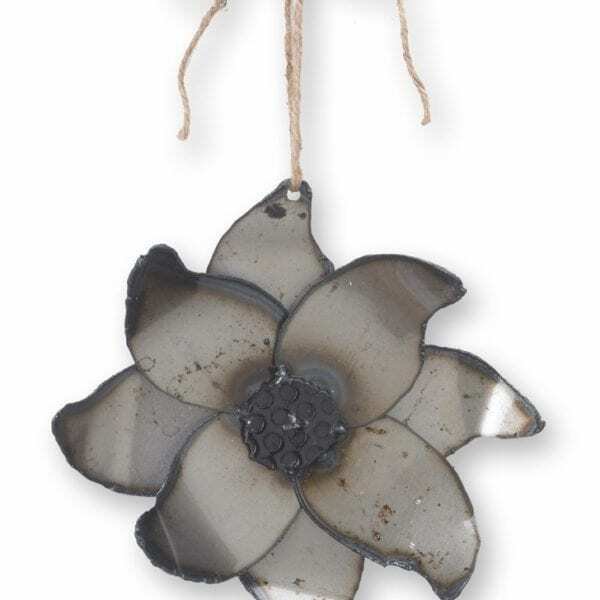 Each petal is hand hammered and welded into shape. The color is natural milk paint. 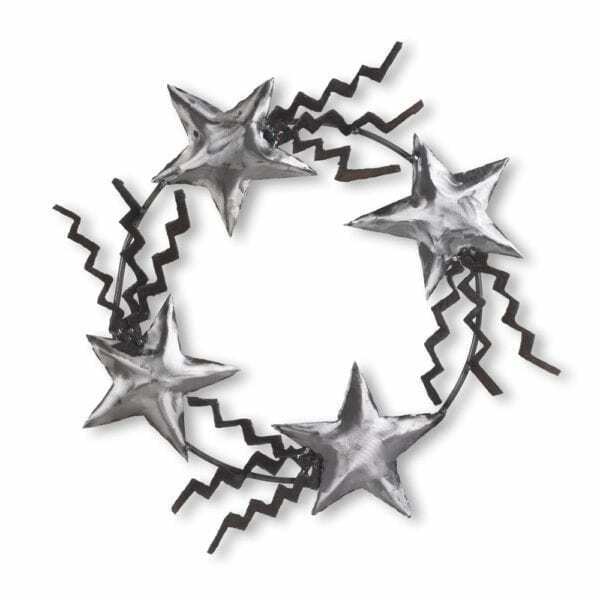 This garland is handmade in Pennsylvania from reclaimed metal. The pattern is hand drawn on the metal with soapstone and cut with a hand held plasma cutter. It is then hand hammered and welded into shape. 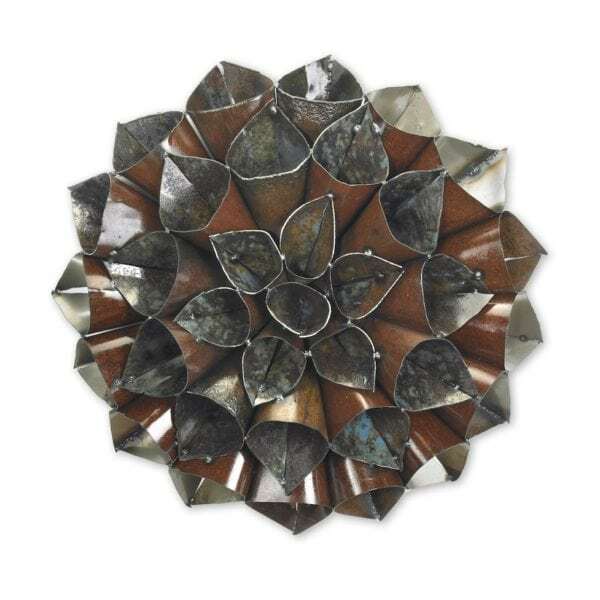 This Dahlia wall sculpture is handmade in Pennsylvania from reclaimed metal. Each "petal" is hand hammered into shape, and welded. 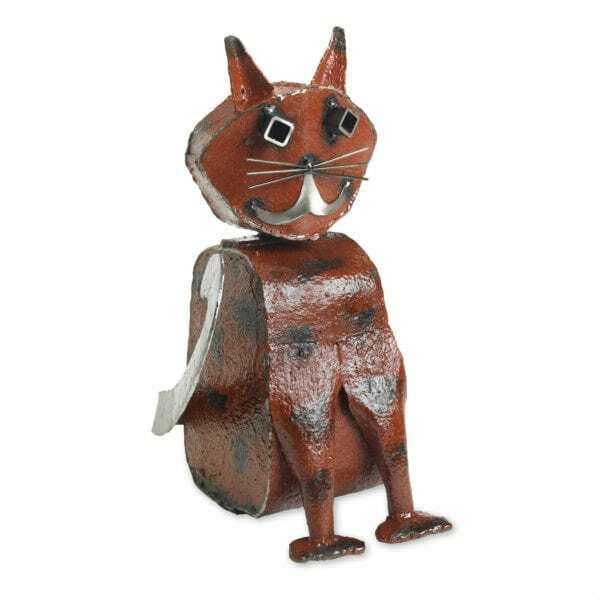 This Cat sculpture is handmade in Pennsylvania from reclaimed metal. 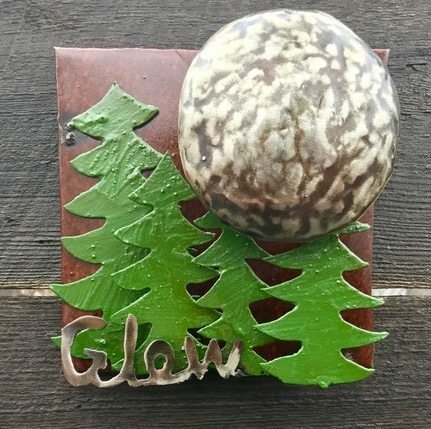 The pattern is hand drawn on the metal with soapstone and cut with a hand held plasma cutter. 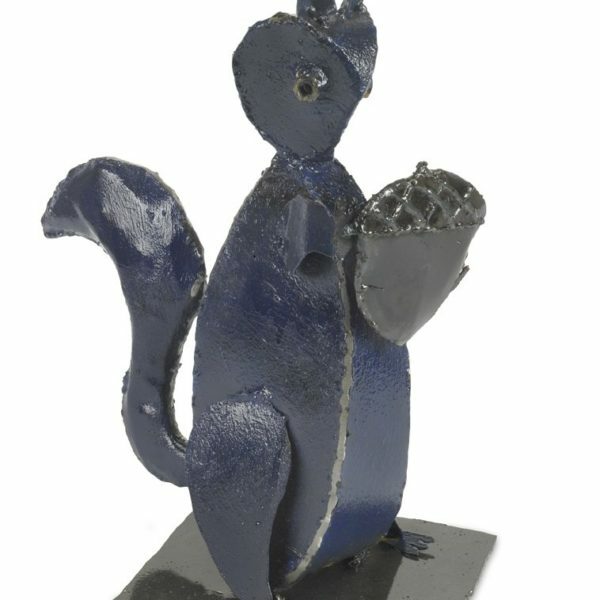 The Cat is then hand hammered and arc welded into shape. The color is created with natural milk paint. 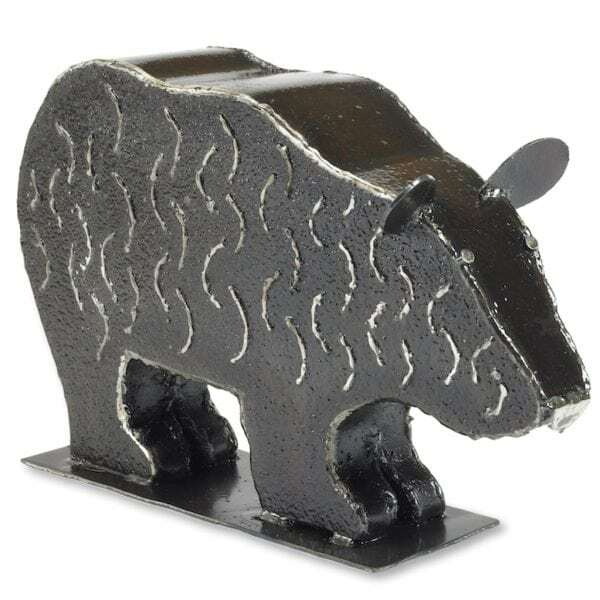 This Bear sculpture is handmade in Pennsylvania from reclaimed metal. The pattern is hand drawn on the metal with soapstone and cut with a hand held plasma cutter. The Bear is then hand hammered and arc welded into shape. 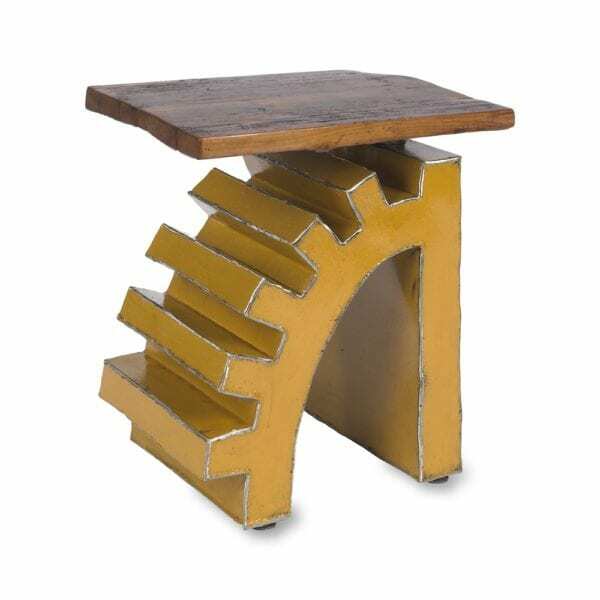 This side table is handmade in Pennsylvania. 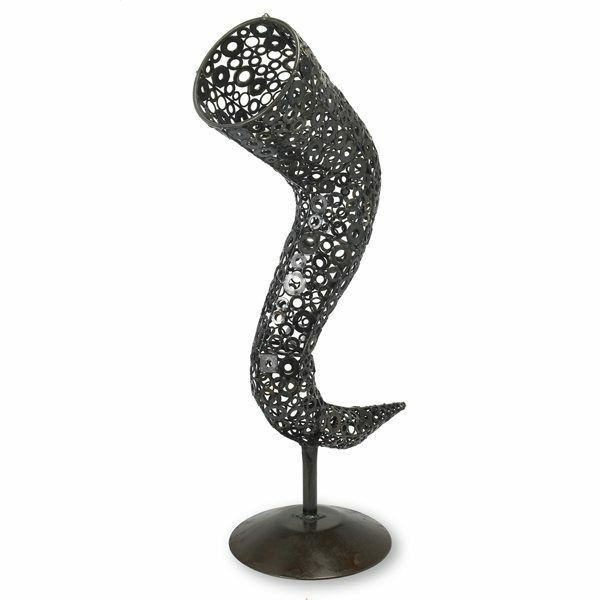 It is created with shapes that are hand-cut, and welded together. They are then rolled into shop. 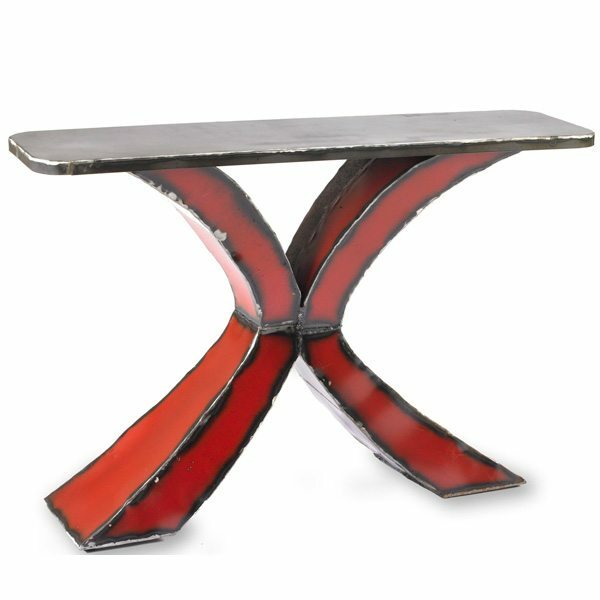 This table features a new piece of US made 10 gauge steel top. 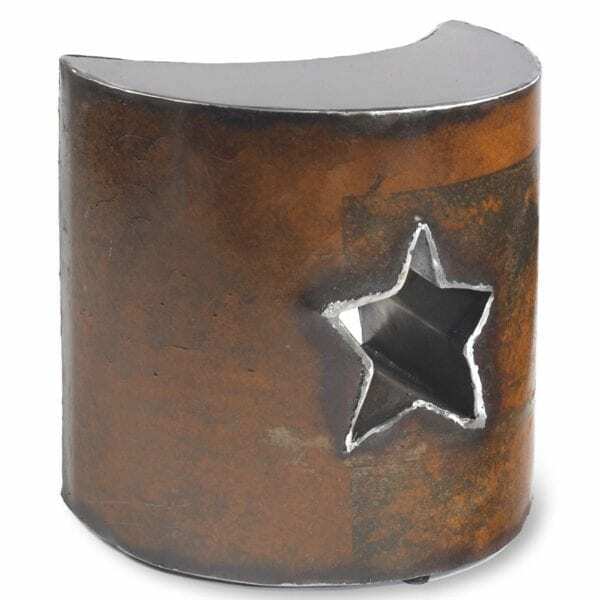 It can be used indoors or outdoors and is perfect as an accent to your favorite armchair. 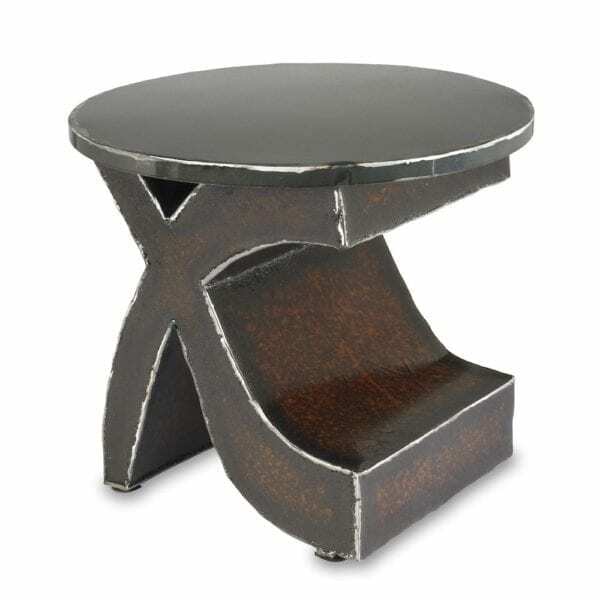 The table has adjustable chrome feet perfect for any surface. 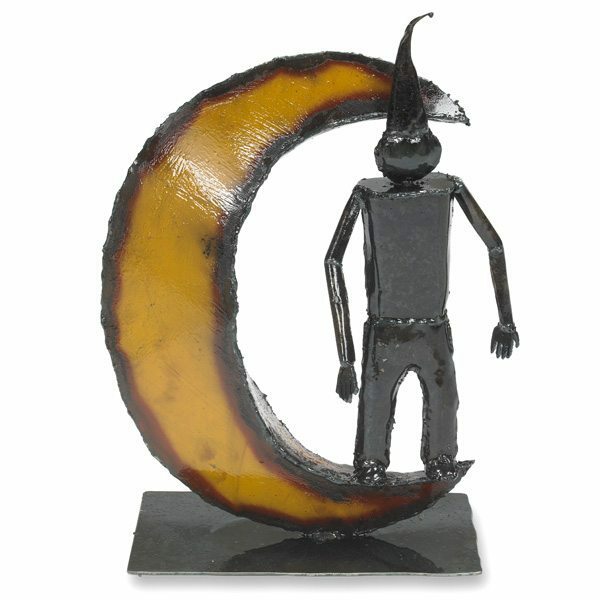 Finish off your beautiful Holiday tree with this lovely handmade moon! 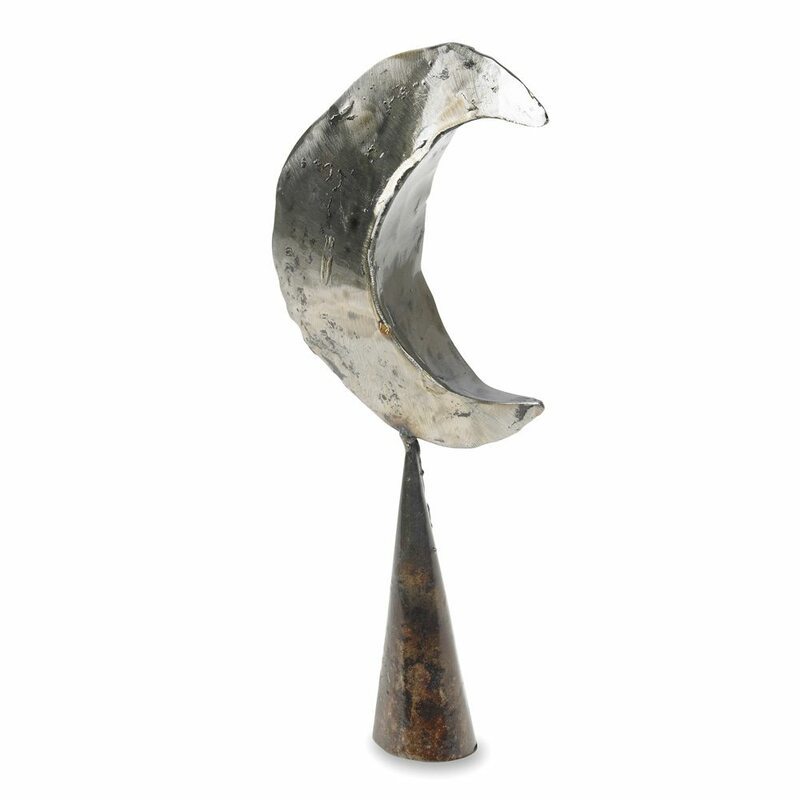 This moon is made with reclaimed metal. The pattern is hand drawn on the metal with soapstone and cut with a hand held plasma cutter. Each moon will have subtle variations. They are cut by hand and each piece of rusty metal has slight color differences. 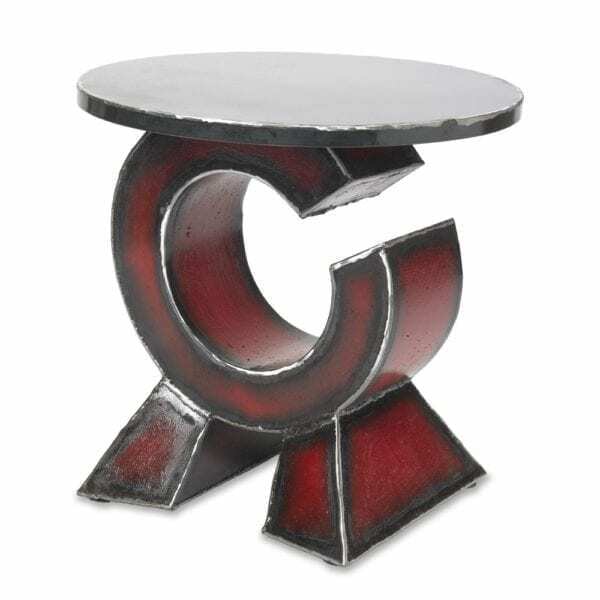 Mark your favorite armchair by pairing it with this "on target" table! 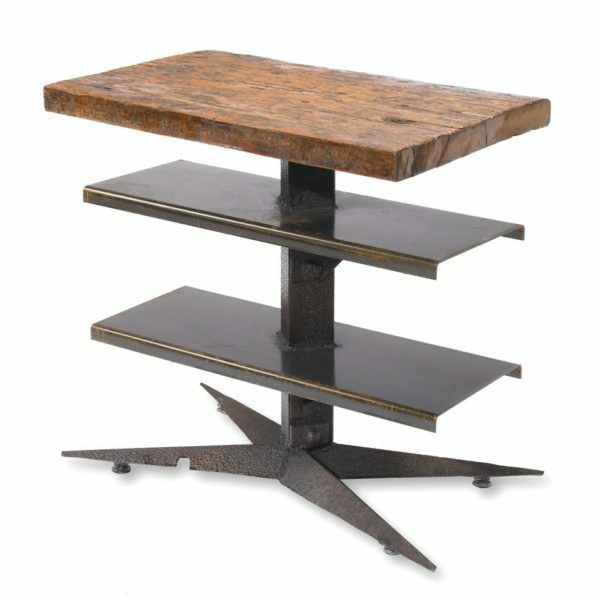 We created this table from reclaimed metal. We hand draw the pattern on the metal with soapstone and cut it with a hand held plasma cutter. We then hand hammer and weld it into shape. This table is approximately 40lbs. 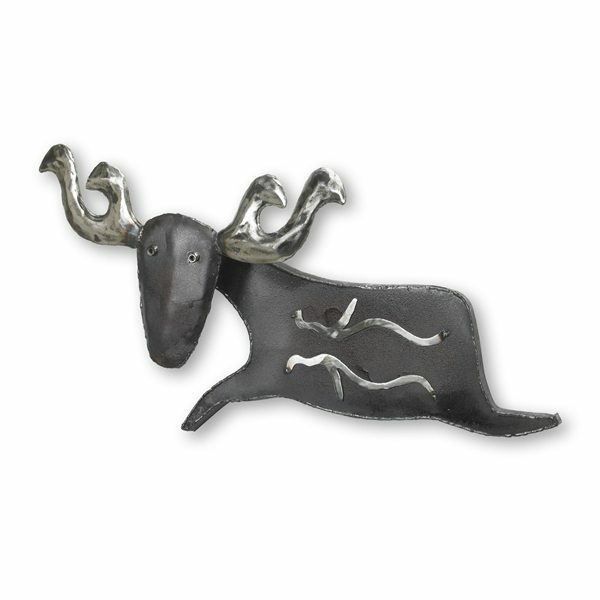 Make a statement on your wall with this dramatic antler sculpture. 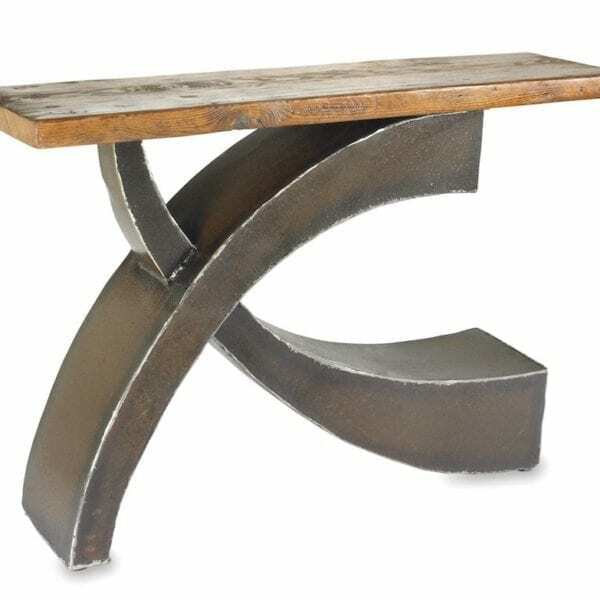 It is created with reclaimed metal. 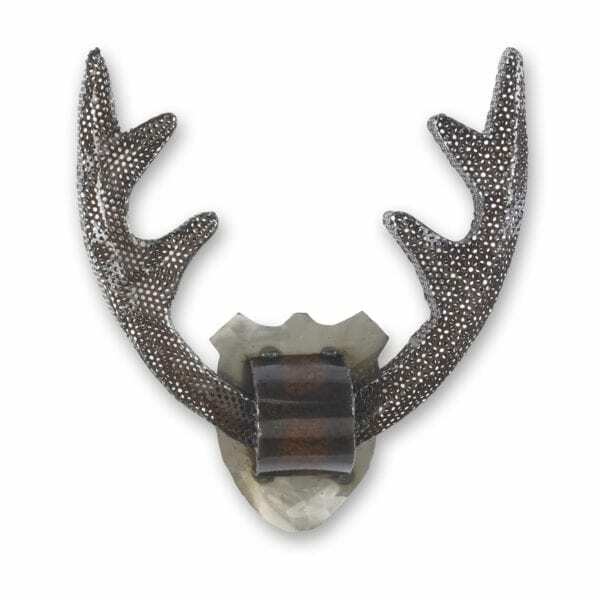 We hand draw the antlers on the metal with soapstone and cut it with a hand held plasma cutter. Next we hand hammer each antler into shape, and weld it together. 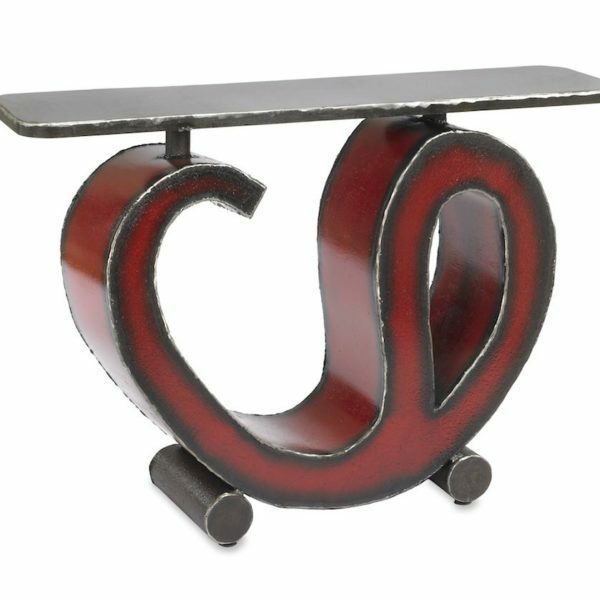 Create an artistic entryway (or living space) with this strong and elegant console table. 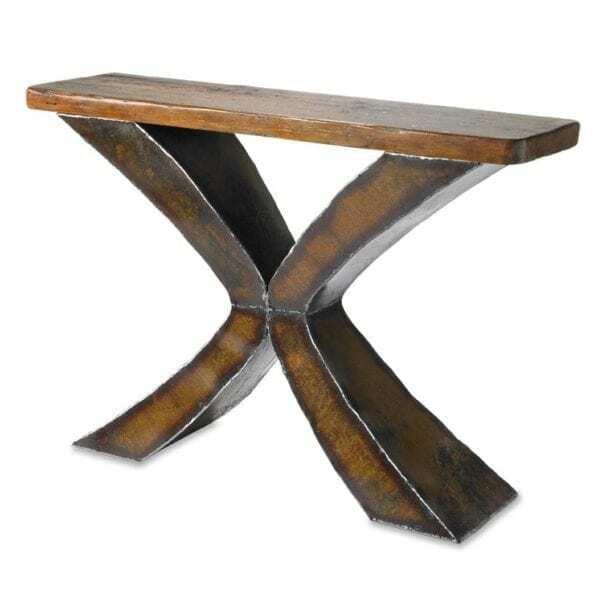 This unique console table was handmade here in Pennsylvania. 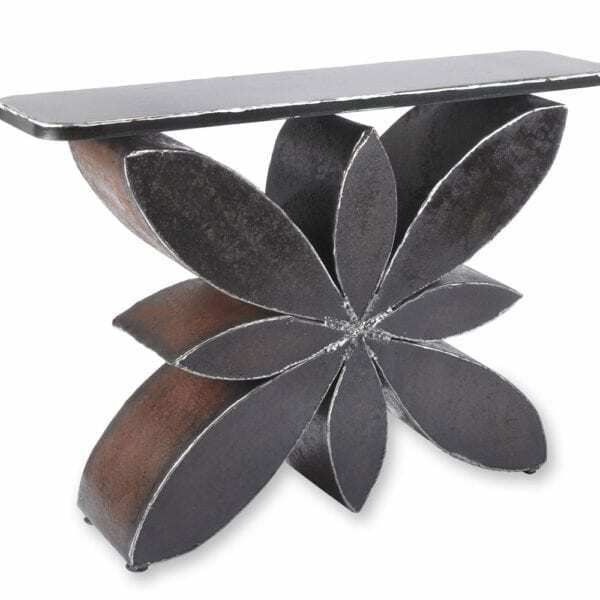 To create the body of the table we hand cut reclaimed sheet metal and weld it into shape. To create the wood top we hand cut, plane and sand reclaimed wood from an old barn. 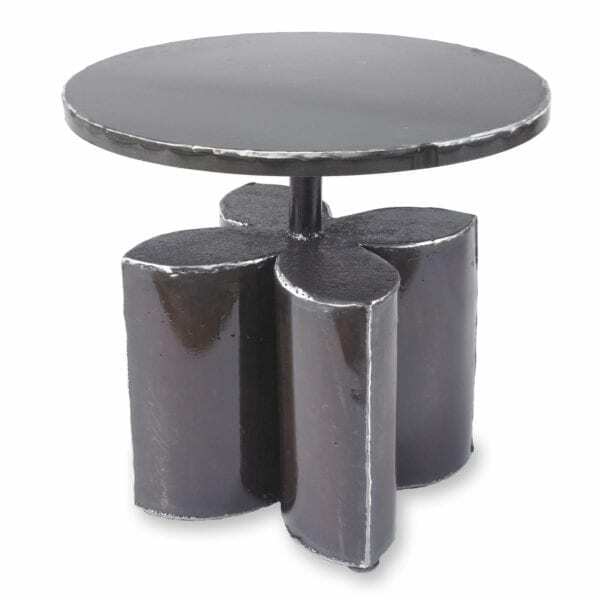 Each table will have unique variations, no pieces of metal will wear alike. We are always happy to email you a photo prior to shipping- simply contact us. This table is approximately 70lbs. 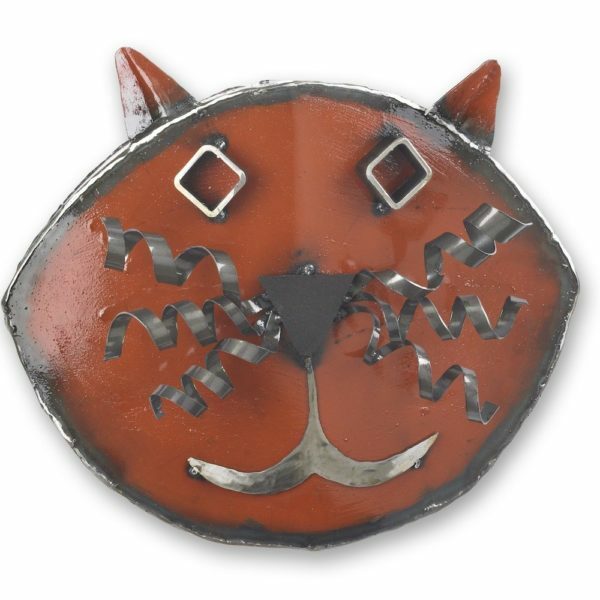 Make a statement on your wall with this fun cat wall sculpture. 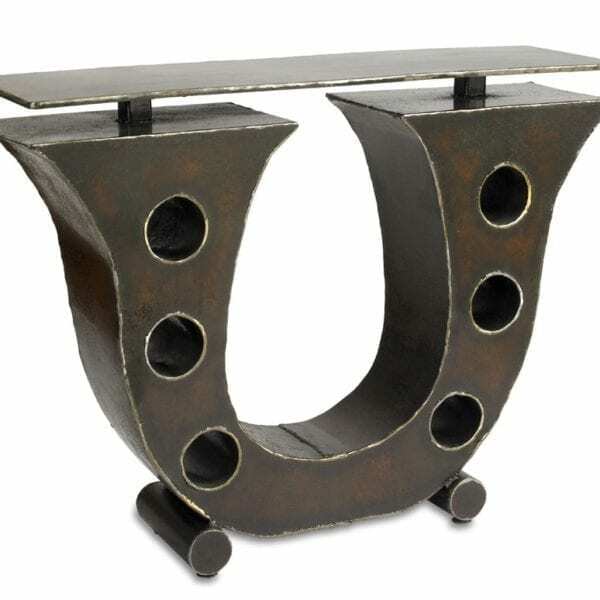 It is created with reclaimed metal. We hand draw the head pattern on the metal with soapstone and cut it with a hand held plasma cutter. Next we weld the shapes together to form the head. We paint it with all natural milk paint. 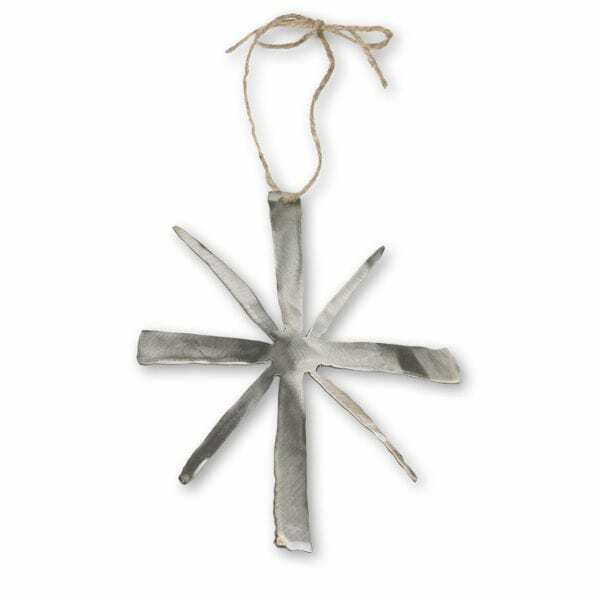 We created this simple tipi ornament with reclaimed metal. We hand draw the pattern on the metal with soapstone and cut it with a hand held plasma cutter. The red is hand-painted white paint. 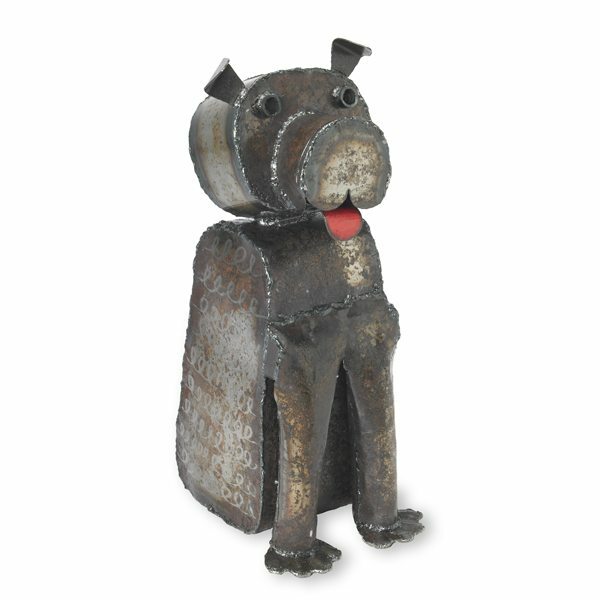 We created this darling little, dog entirely from reclaimed metal. We hand draw the pattern on the metal with soapstone and cut it with a hand held plasma cutter. 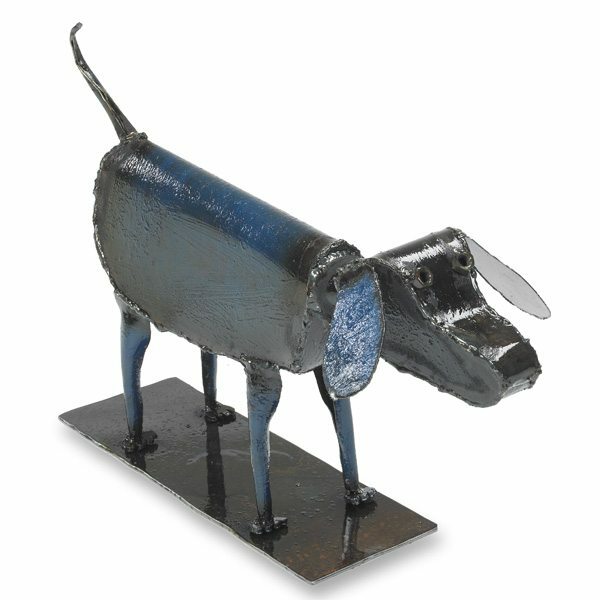 We then hand hammer and arc weld the dog into shape. The blue is hand painted milk paint. 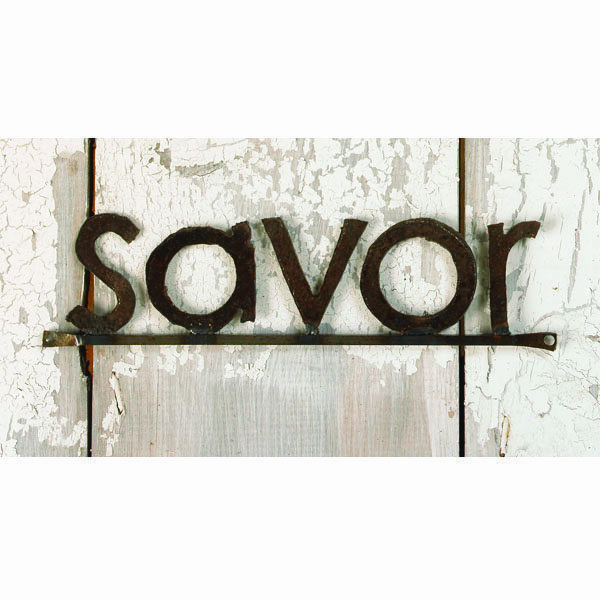 This “savor” sign is hand-cut from reclaimed metal. The pattern is hand drawn on the metal with soapstone and cut with a hand held plasma cutter. 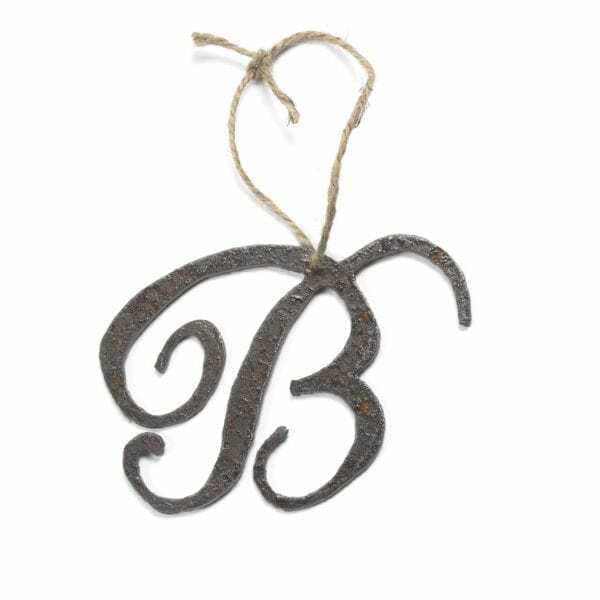 The metal is sealed so you can hang this charming little sign inside or out. The sign is easy to hang with either a nail or screw. 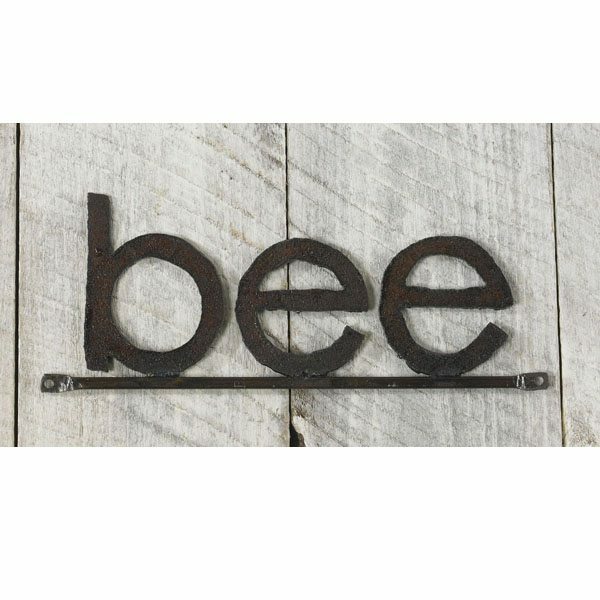 Each sign is hand-cut from reclaimed metal. The pattern is hand drawn on the metal with soapstone and cut with a hand held plasma cutter. 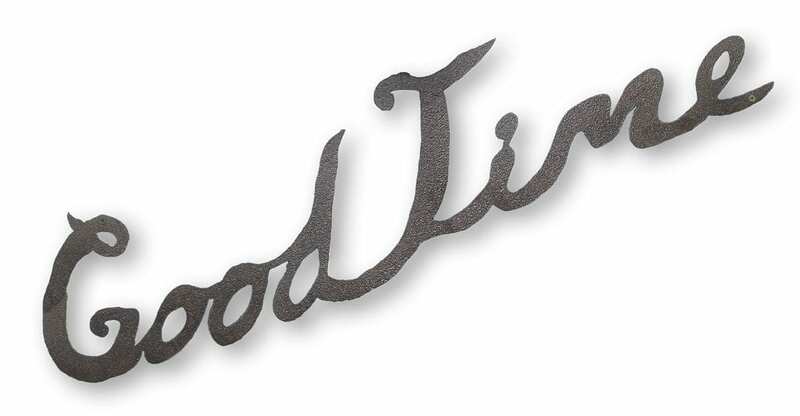 The metal is sealed so you can hang this charming sign inside or out. The sign is easy to hang with either a nail or screw. Each sign will have very subtle variations. They are cut by hand and each piece of rusty metal has slight color differences. Care: Wipe clean with a damp cloth. If outdoors, you can maintain a shiny metal look [entirely optional] by applying a clear metal enamel, available in a spray can at your local hardware store. 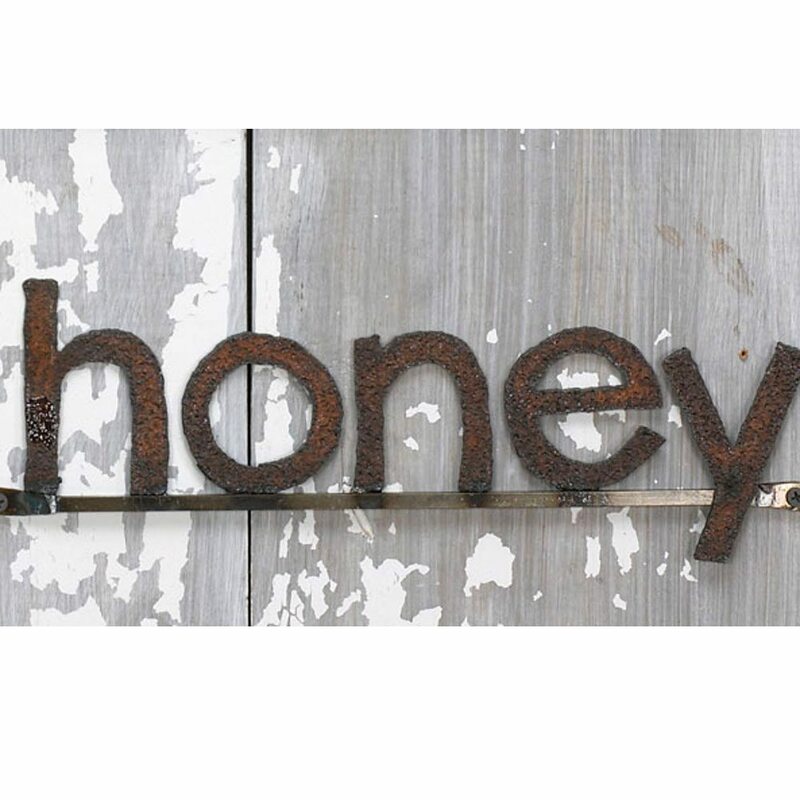 This darling sign is hand-cut from reclaimed metal. The pattern is hand drawn on the metal with soapstone and cut with a hand held plasma cutter. 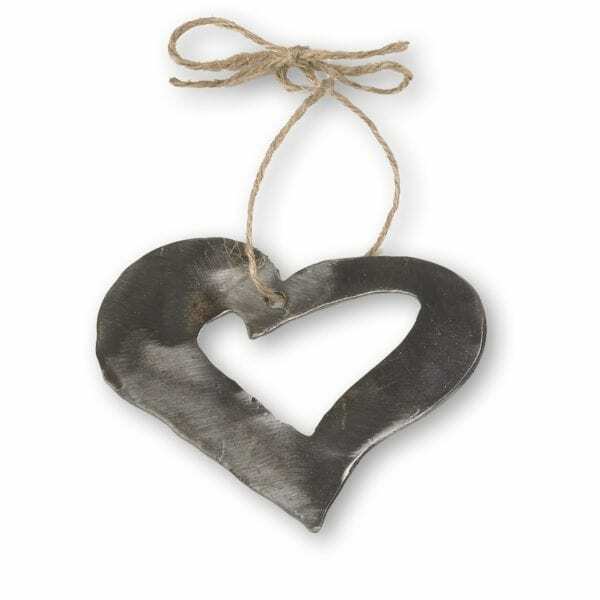 The metal is sealed so you can hang this charming sign inside or out. The sign is easy to hang with either a nail or screw. 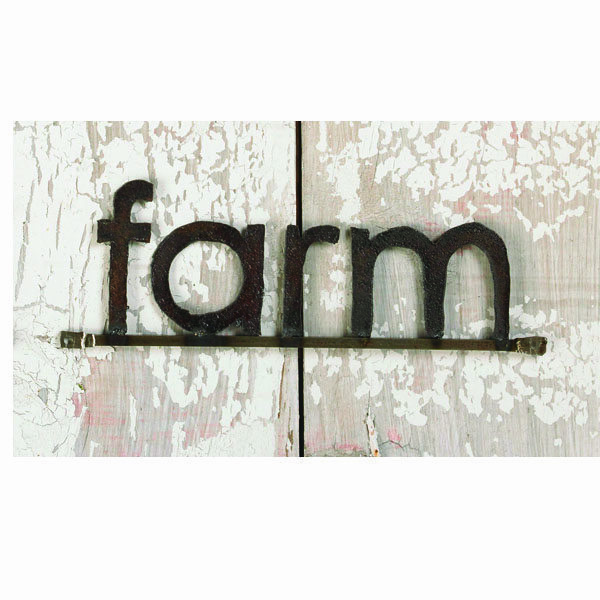 This “farm” sign is hand-cut from reclaimed metal. The pattern is hand drawn on the metal with soapstone and cut with a hand held plasma cutter. 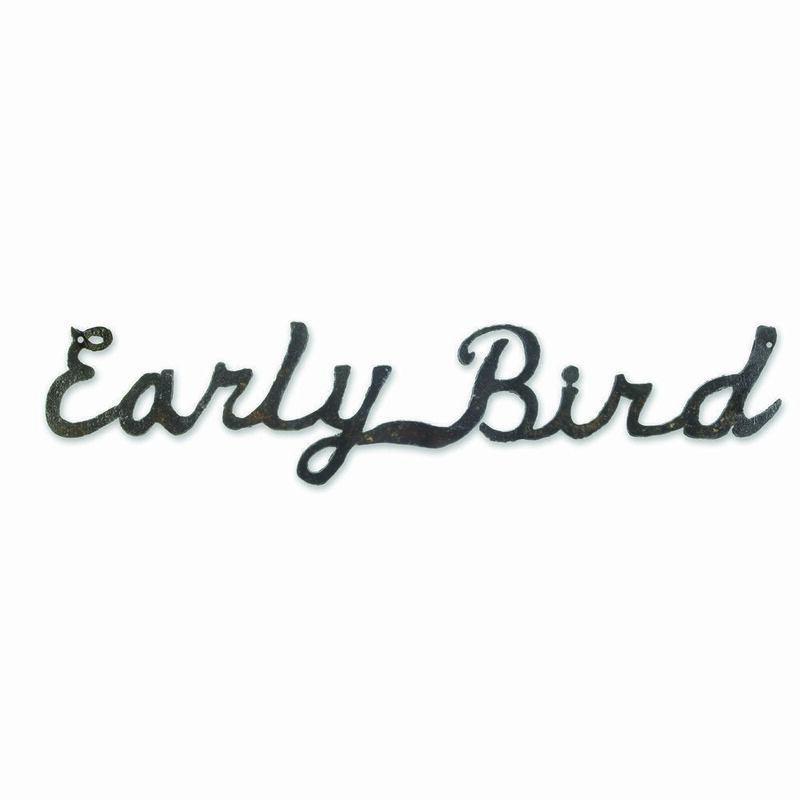 The metal is sealed so you can hang this charming little sign inside or out. The sign is easy to hang with either a nail or screw. Each sign will have very subtle variations. They are cut by hand and each piece of rusty metal has slight color differences. Care: Wipe clean with a damp cloth. If outdoors, you can maintain a shiny metal look [entirely optional] by applying a clear metal enamel, available in a spray can at your local hardware store. 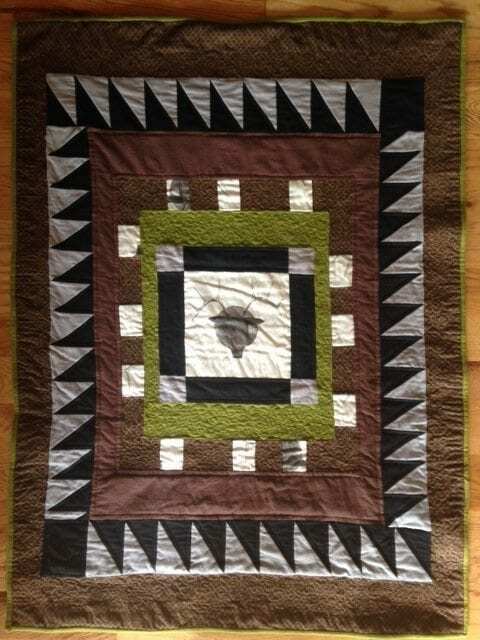 Size: 11 inches wide by 4” high. 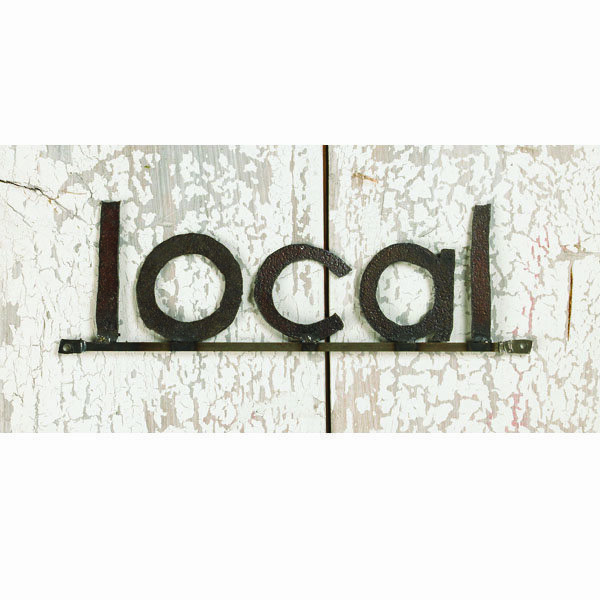 This lovely sign was created as a tribute to “local” food. 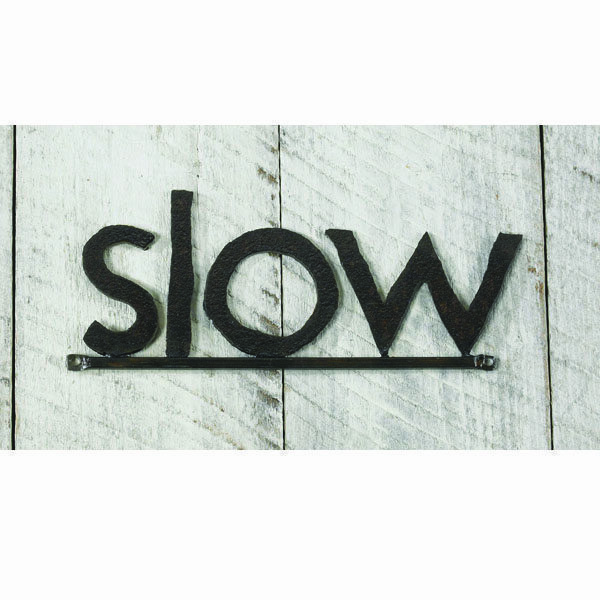 Each sign is hand-cut from reclaimed metal. 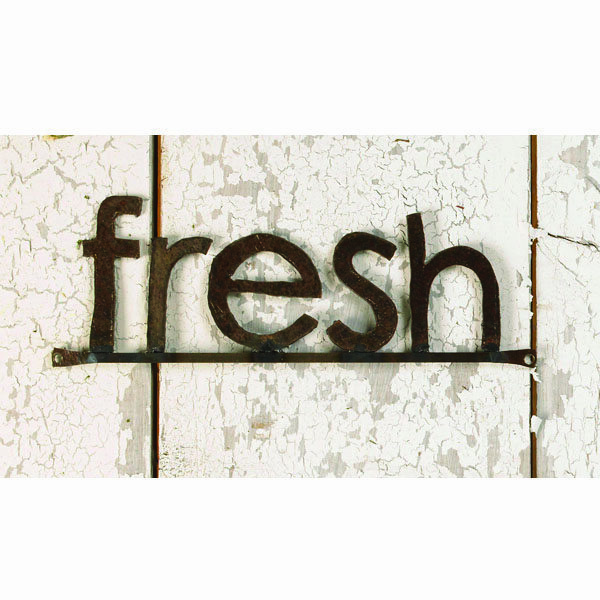 These lovely little signs are perfect for your kitchen or at your farm stand. 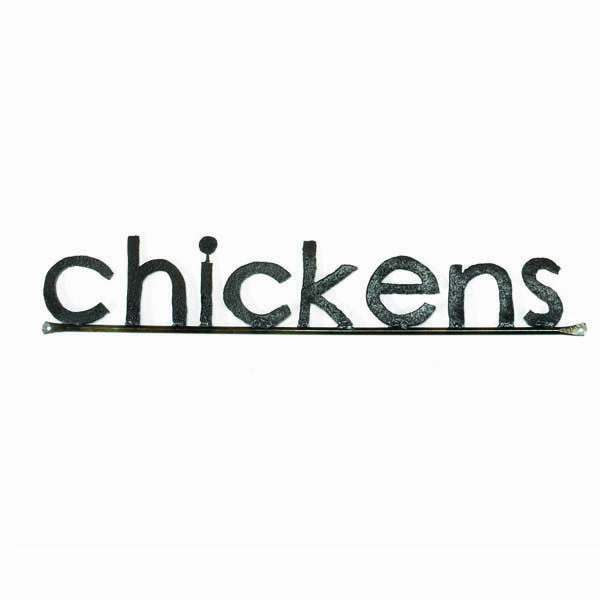 Each sign is hand-cut from reclaimed metal. The pattern is hand drawn on the metal with soapstone and cut with a hand held plasma cutter. The metal is sealed so you can hang this charming little sign inside or out. The sign is easy to hang with either a nail or screw. Each sign will have very subtle variations. 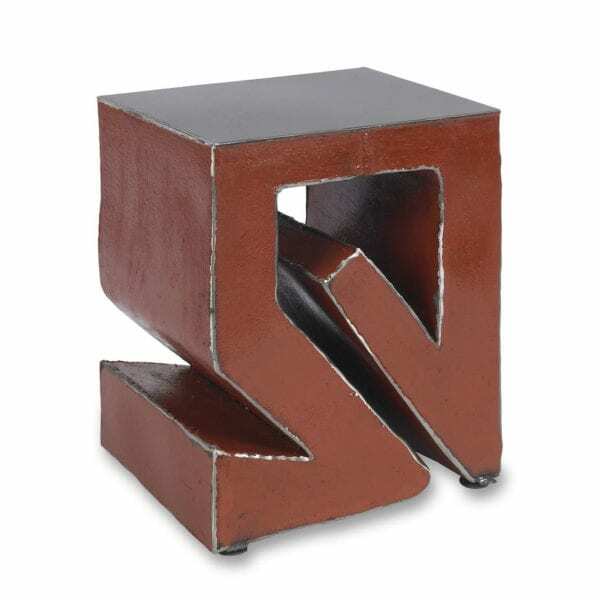 They are cut by hand and each piece of rusty metal has slight color differences. Each one is made to order and will ship in 3-5 business days. Care: Wipe clean with a damp cloth. If outdoors, you can maintain a shiny metal look [entirely optional] by applying a clear metal enamel, available in a spray can at your local hardware store. Each sign is hand-cut from reclaimed metal. The pattern is hand drawn on the metal with soapstone and cut with a hand held plasma cutter. 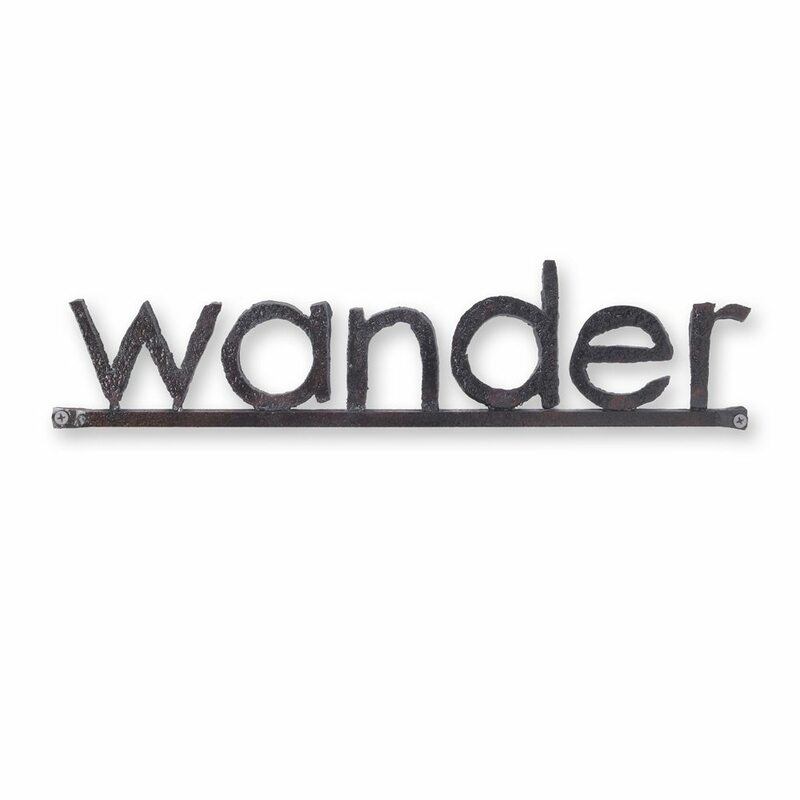 The metal is sealed so you can hang this charming little sign inside or out. The sign is easy to hang with either a nail or screw. Each sign will have very subtle variations. 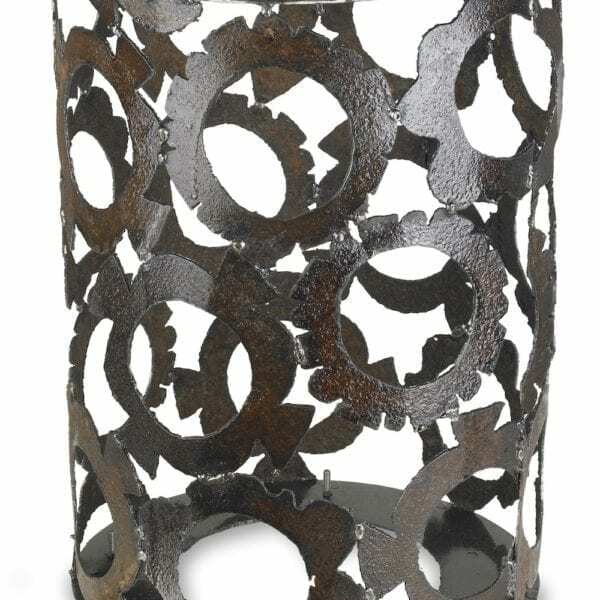 They are cut by hand and each piece of rusty metal has slight color differences. Care: Wipe clean with a damp cloth. If outdoors, you can maintain a shiny metal look [entirely optional] by applying a clear metal enamel, available in a spray can at your local hardware store. 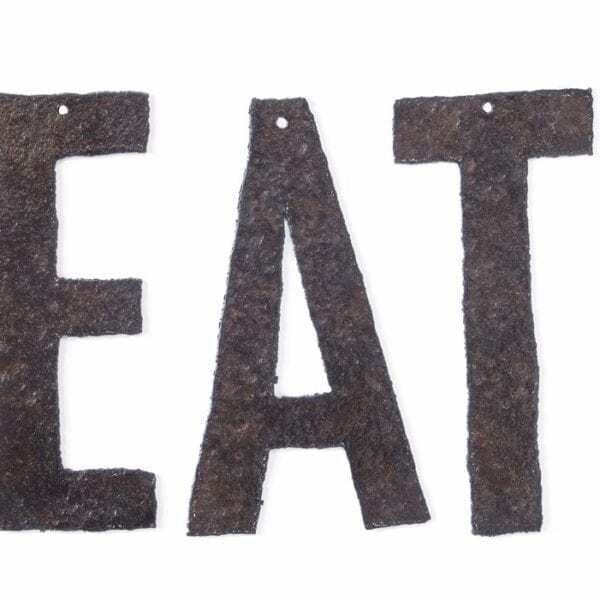 These lovely little signs are made with reclaimed metal. Each sign is hand-cut. The pattern is hand drawn on the metal with soapstone and cut with a hand held plasma cutter. 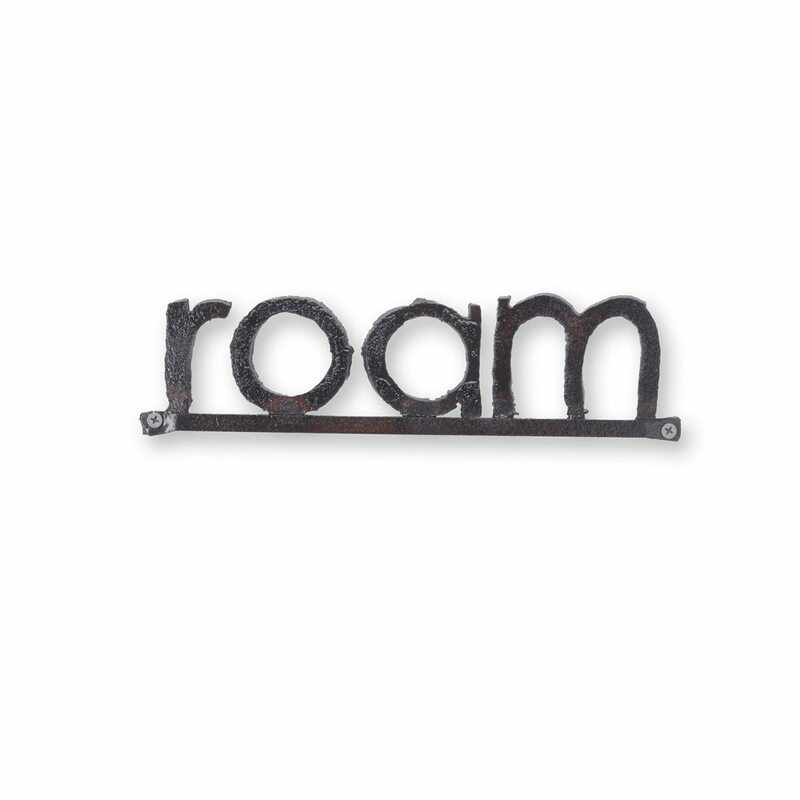 The metal is sealed so you can hang this charming little sign inside or out. The sign is easy to hang with either a nail or screw. Each hook will have very subtle variations. They are cut by hand and each piece of rusty metal has slight color differences. Each one is made to order and will ship in 3-5 business days. 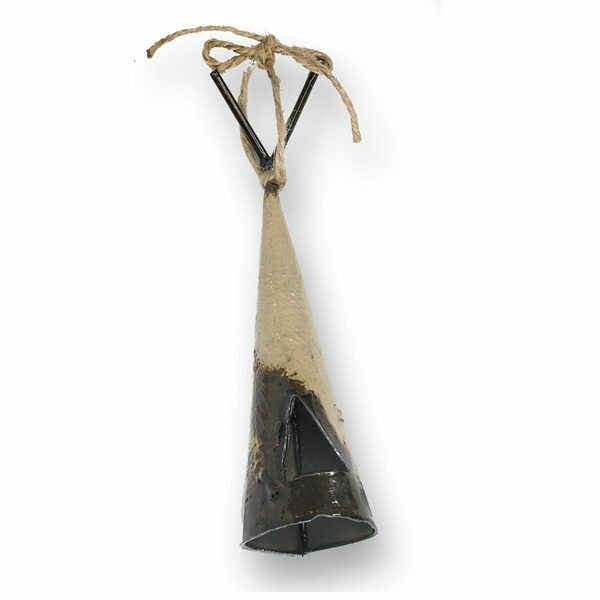 Your hook will come gift wrapped in tissue paper and tied with ribbon. Care: Wipe clean with a damp cloth. If outdoors, you can maintain a shiny metal look [entirely optional] by applying a clear metal enamel, available in a spray can at your local hardware store. 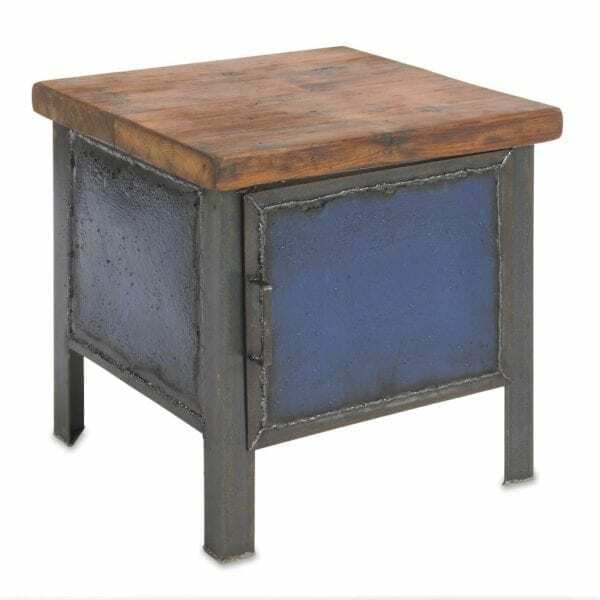 This table is handmade by with sheets of reclaimed metal. 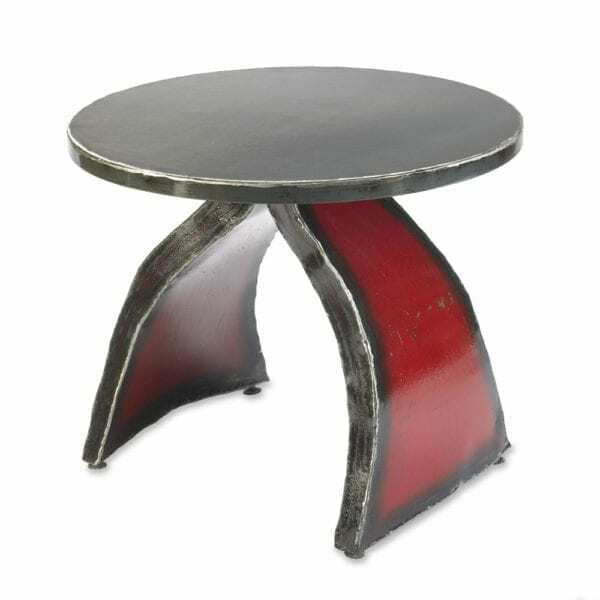 Each table features reclaimed metal hand cut and bent into shape to form the base. 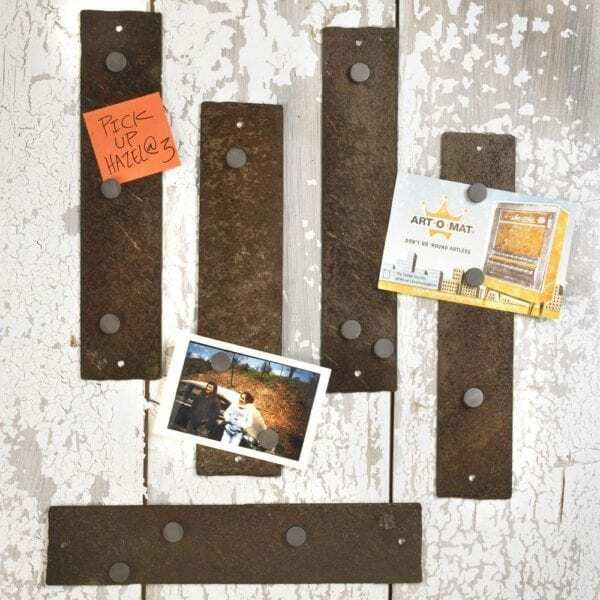 The top is made with a piece of reclaimed barnwood. 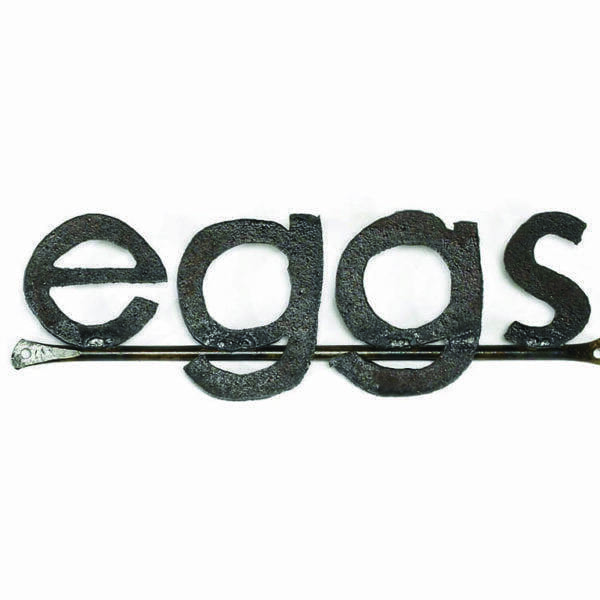 A lovely addition to your kitchen or entry way, this sign is handmade by Ben Gatski in Pennsylvania. 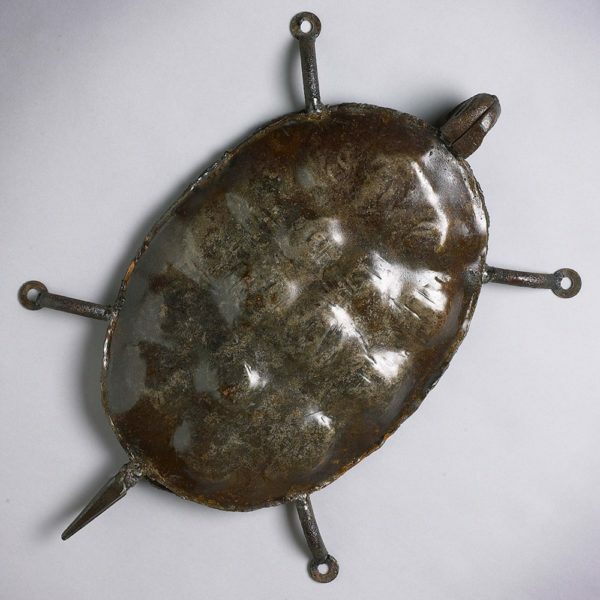 We created this lovely turtle from reclaimed metal. 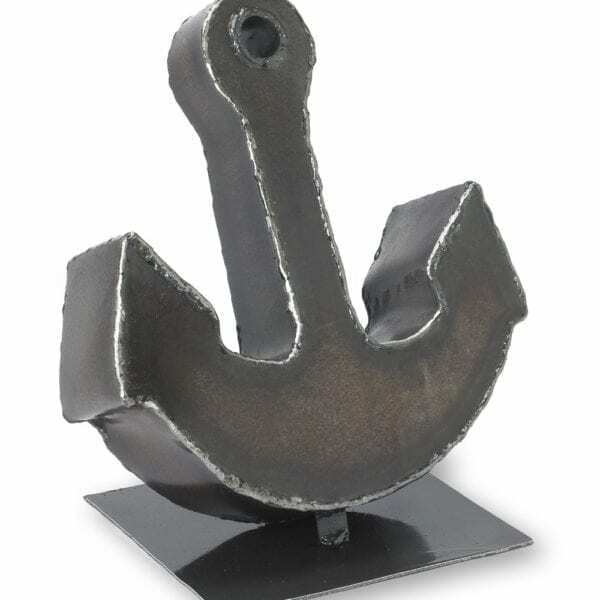 The metal we used is from weathered steel. We hand draw the pattern on the metal with soapstone and cut it with a hand held plasma cutter. We then hand hammer and weld it into shape. 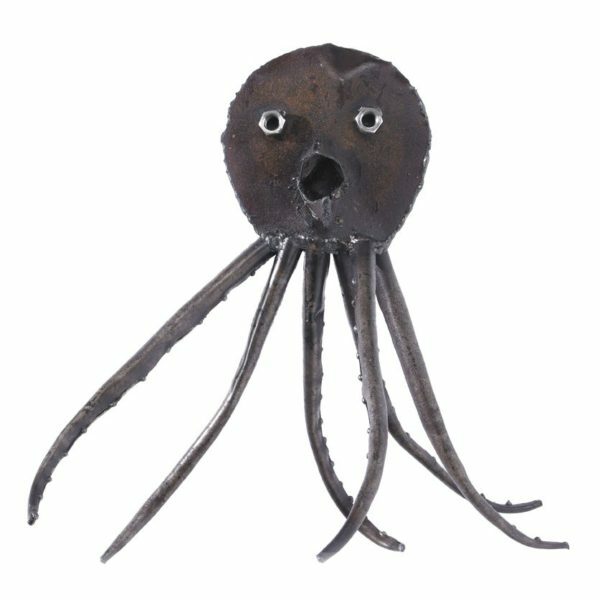 We created this lovely sea creature from reclaimed metal. The metal we used is from weathered steel. We hand draw the pattern on the metal with soapstone and cut it with a hand held plasma cutter. We then hand hammer and weld it into shape. 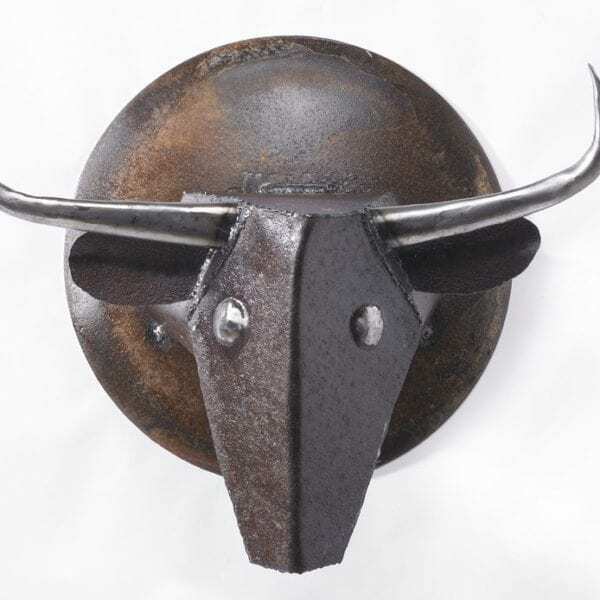 This lovely steer head is handmade with reclaimed metal in rural Pennsylvania. 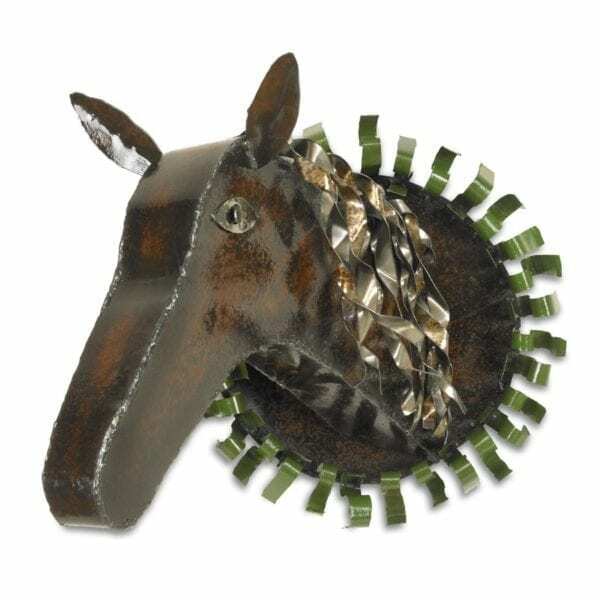 The head pattern is hand drawn on the metal with soapstone and cut with a hand held plasma cutter. The shapes are then hand hammered and arc welded together to form the head. The head is mounted on a recycled corn planter disk. Hat's off to you! 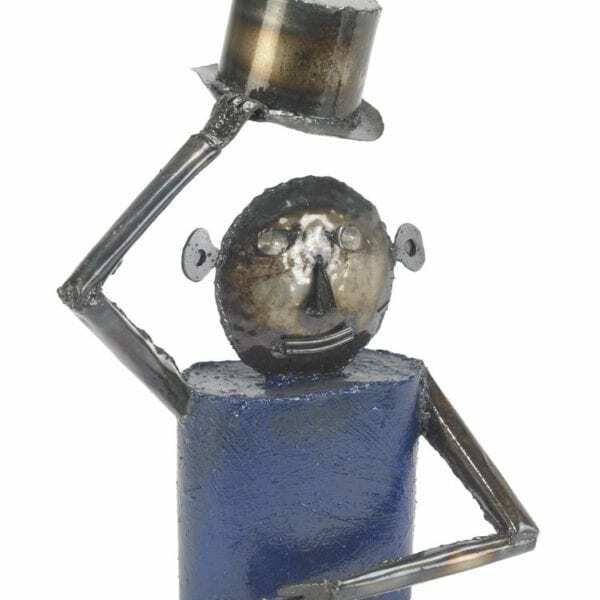 This darling man whom we call, "Sir Blue" is handmade in Pennsylvania by Ben Gatski. The metal we use is from weathered steel. We hand draw the pattern on the metal with soapstone and cut it with a hand held plasma cutter. We then hand hammer and weld it into shape. The blue was hand painted with milk paint. 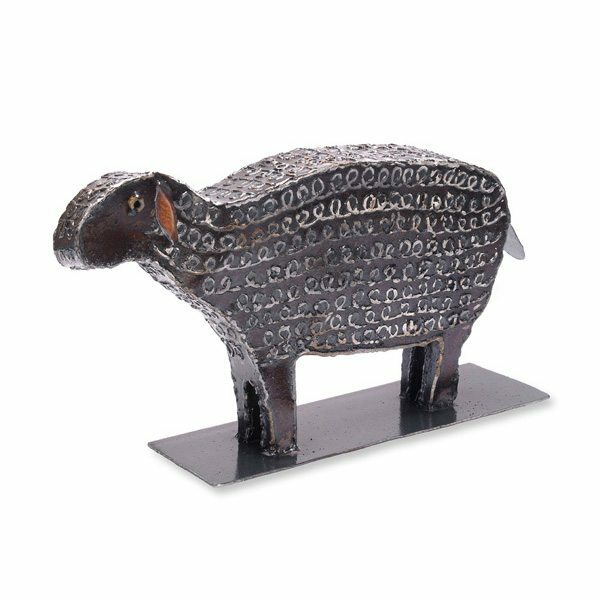 This sheep sculpture is handmade with reclaimed metal steel. We hand draw the pattern on the metal with soapstone and cut it with a hand held plasma cutter. We then hand hammer and weld it into shape. 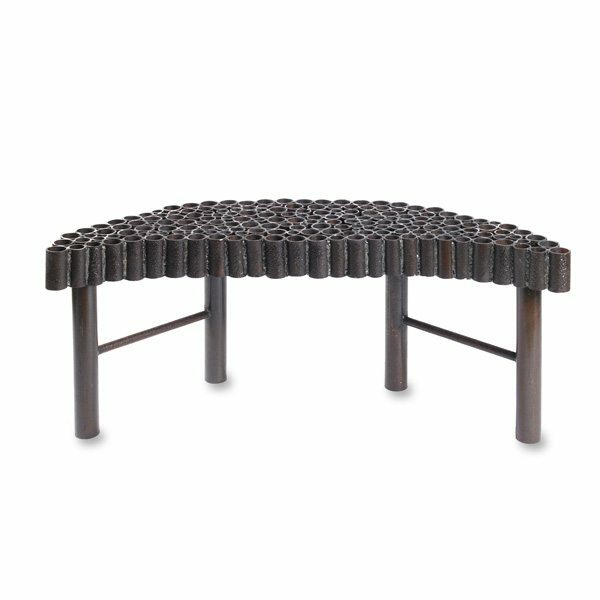 This table is handmade by Ben Gatski in Pennsylvania. 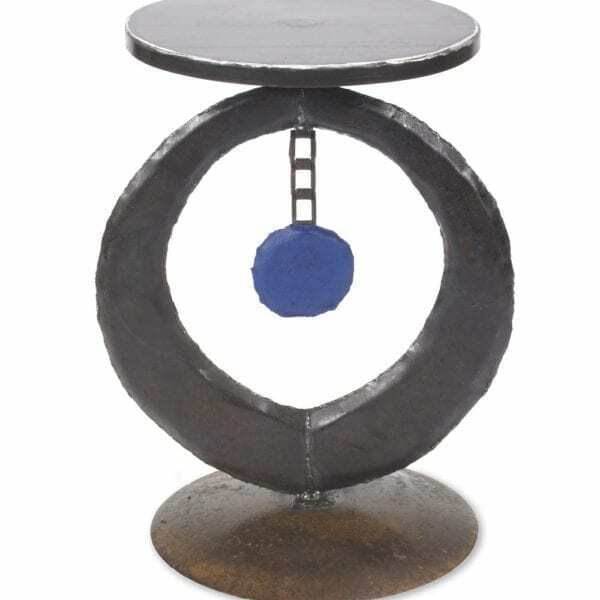 We made the base from reclaimed metal. We hand draw the pattern on the metal with soapstone and cut it with a hand held plasma cutter. We made the top from a new piece of hot rolled steel. We also hand grind all of the edges. 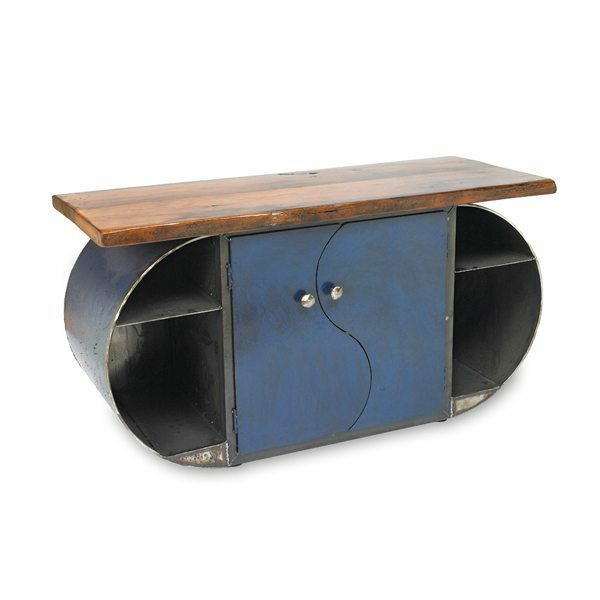 This striking console, entry or sofa table is made with reclaimed wood and steel. The top is wood that was rescued from a Pennsylvania barn before demolition. The base is made with steel pipe that was welded together. A clear coating was applied to the entire table for a shiny finish. 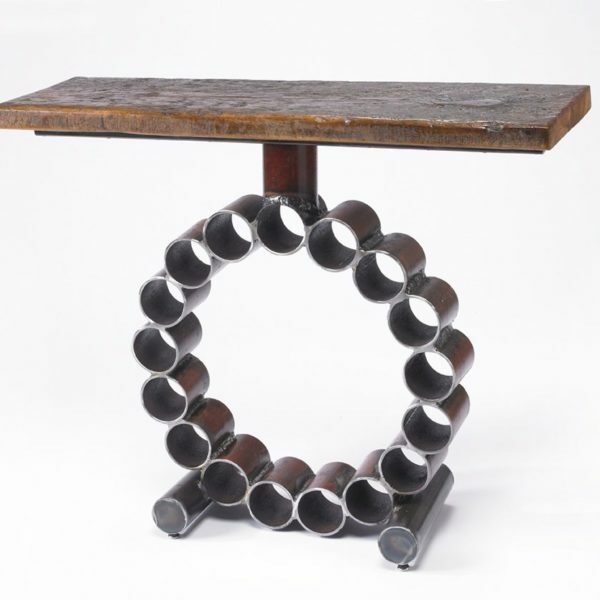 Handmade in Pennsylvania by Ben Gatski, this table is made with reclaimed metal. We made the base by hand hammering flat metal into shape and welding it together. 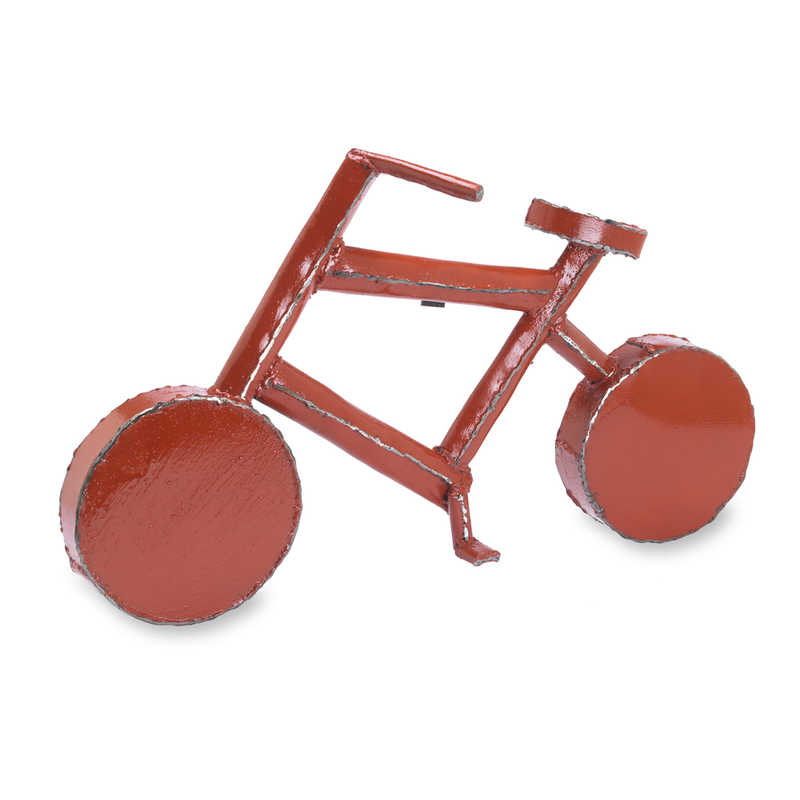 It is painted with red milk paint. We make the top with a new piece of US made 11 gauge steel. 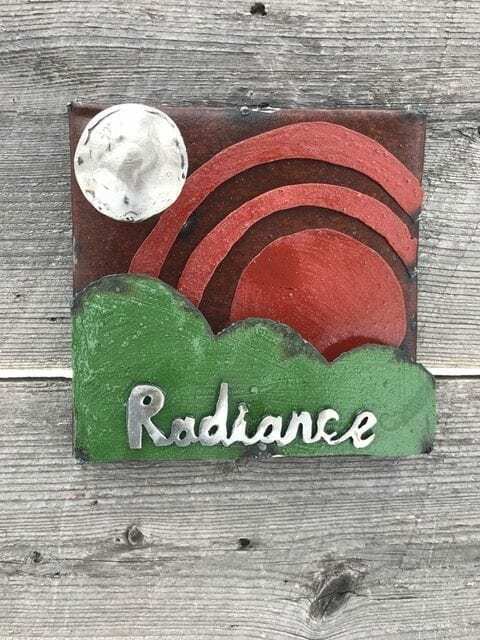 Bring the the wisdom of lunar gardening and biodynamic principles to your home and garden with these unique garden markers. 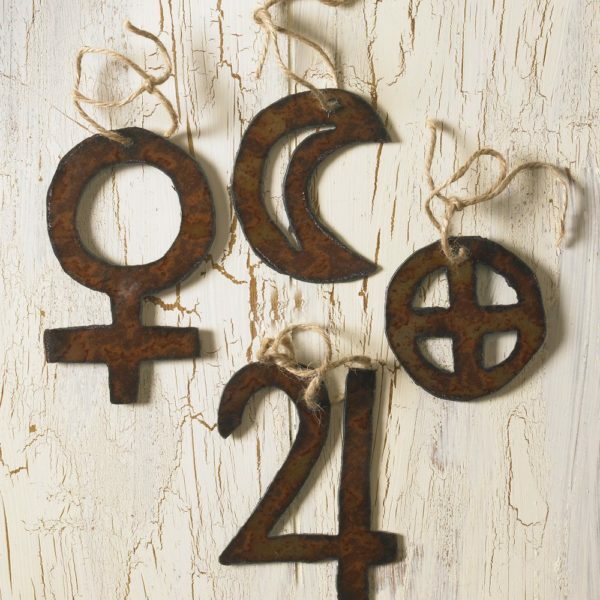 Each represents a planet (and the moon) symbol. 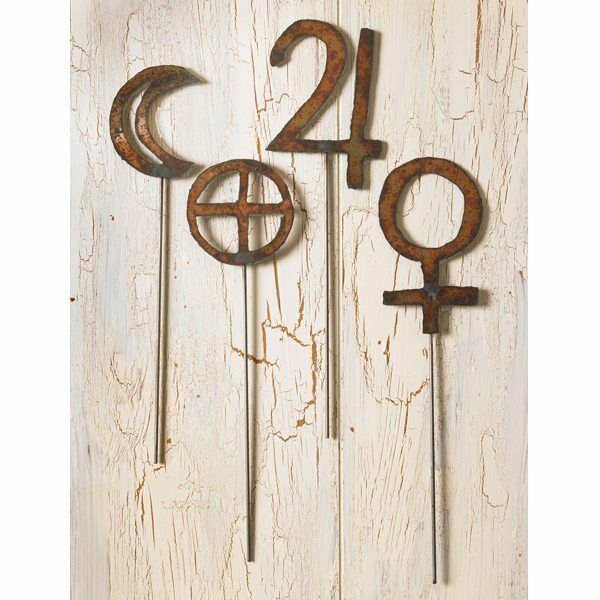 Included in this lovely grouping of four are, Venus to symbolize beauty in the garden, the Moon for the subconscious Jupiter to promote a positive frame of mind, and of course our home Earth. 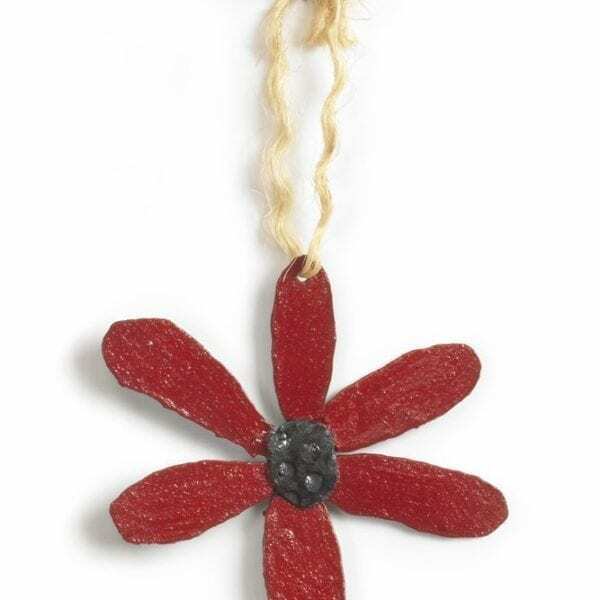 These can be used in your garden, indoor plant or used in a cut flower arrangement. Price is for one garden marker. 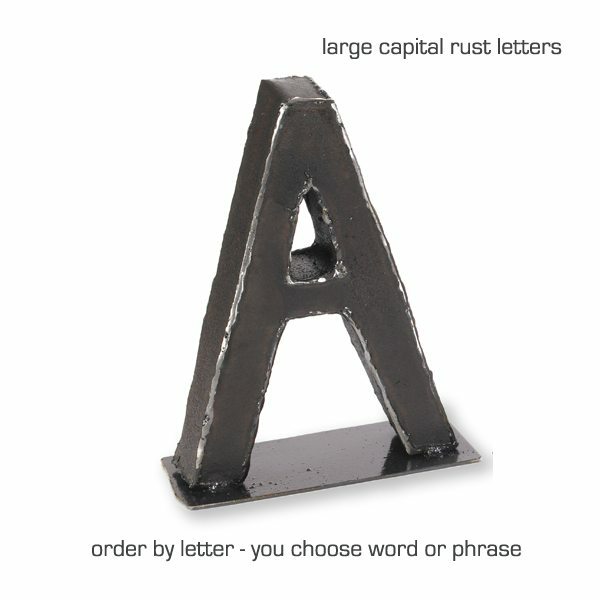 Please indicate the name of the symbol you would like in your "order notes"
Create a truly unique heirloom. 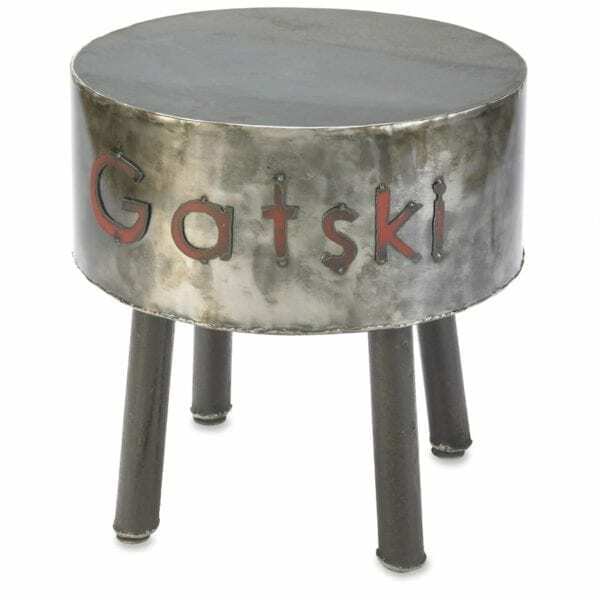 Add your name and a special date, or a special phrase to the side of this metal table. We will create it custom just for you. This table is shown with a name on one side and a date on the other side. We can create something similar for you. Each piece of steel was hand cut and welded together. 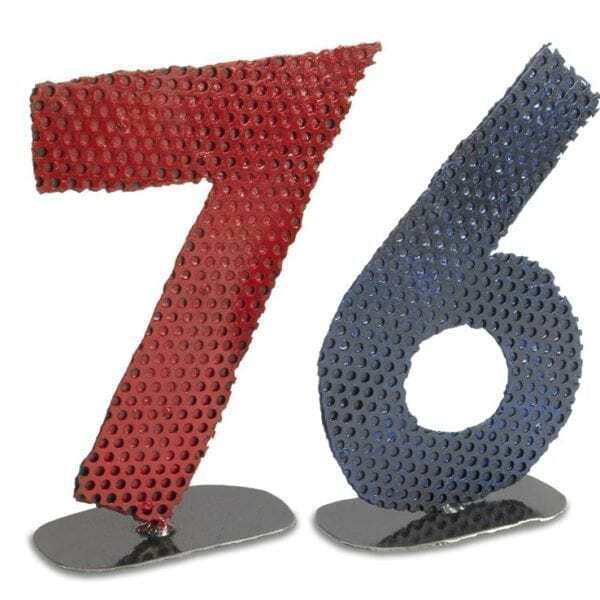 This would make a great gift for your 11th anniversary - the year for steel! Please provide your name and date or phrase in the "order notes" when checking out. Or, describe your table in detail via email - [email protected] If you have any questions at all, we are more than happy to help out. 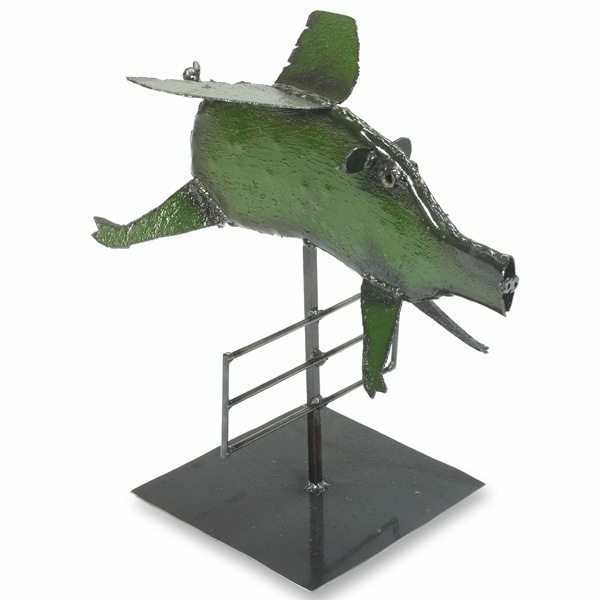 We created this lovely sea creature entirely from reclaimed metal. We hand draw the pattern on the metal with soapstone and cut it with a hand held plasma cutter. We then hand hammer and weld it into shape. 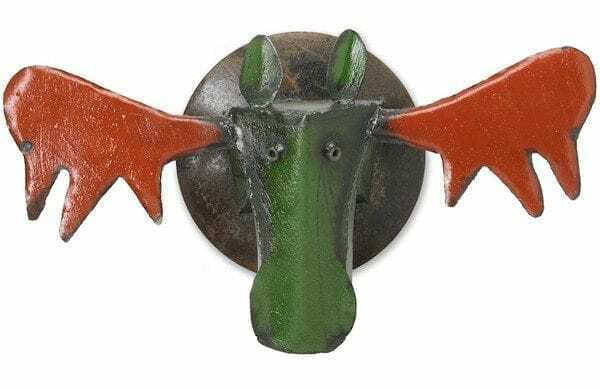 We created this moose head wall sculpture with reclaimed metal. 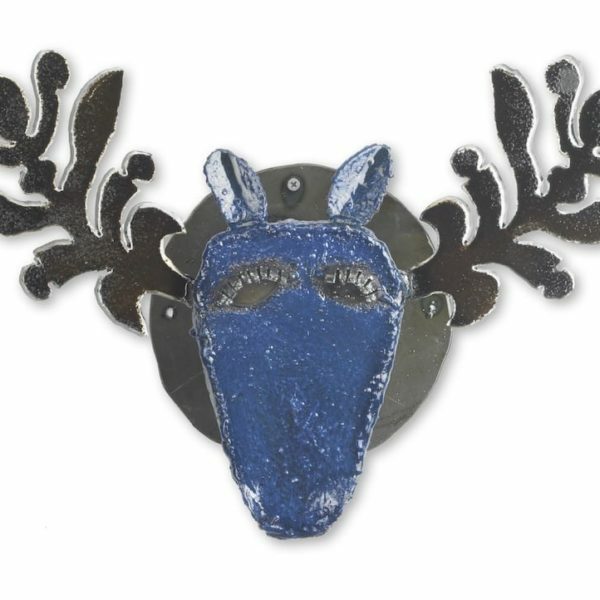 The antlers were painted with blue milk paint. We hand draw the pattern on the metal with soapstone and cut it with a hand held plasma cutter. We then hammer and arc weld the moose into shape. The head is mounted on a recycled corn planter disk. 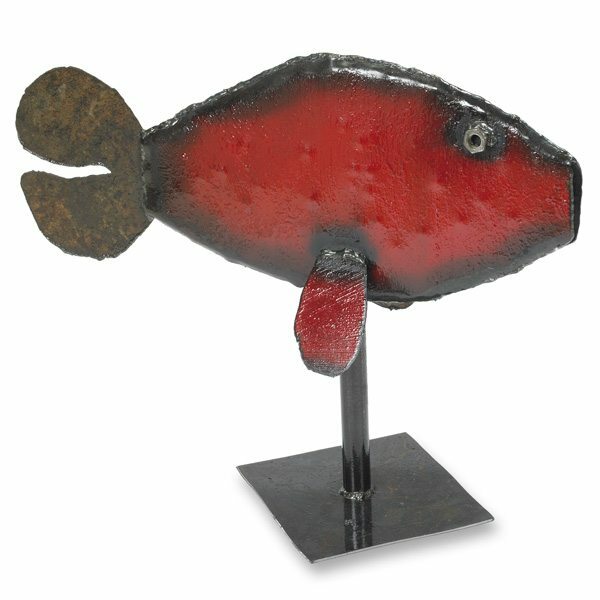 We created this fish sculpture with reclaimed metal. We hand draw the pattern on the metal with soapstone and cut it with a hand held plasma cutter. 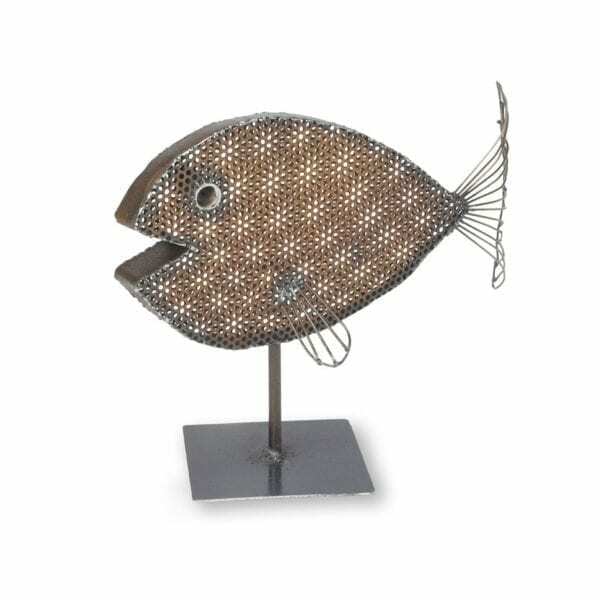 We then hammer and weld the fish into shape. 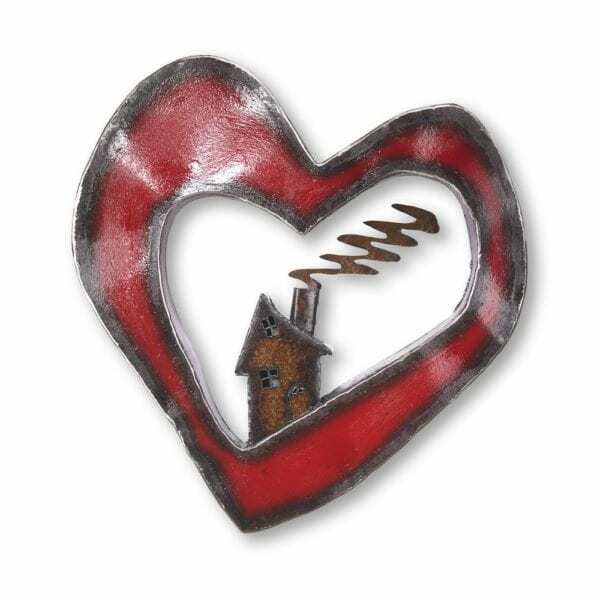 It is hand painted with milk paint. Finally, we attach it to a reclaimed corn planter disk. 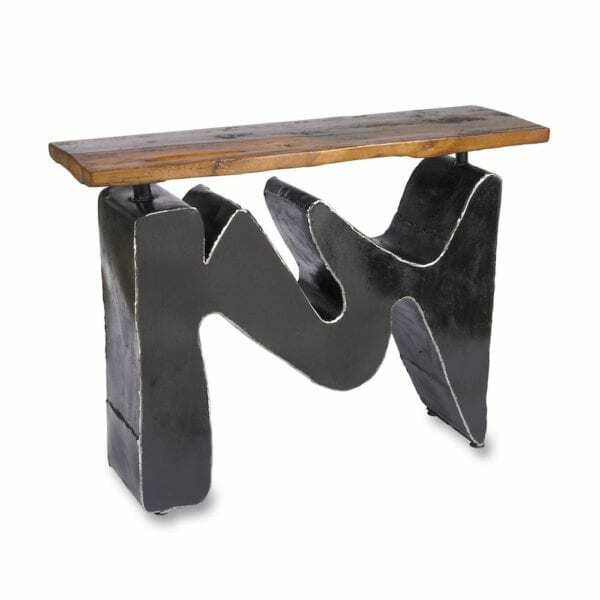 We created this piece with reclaimed metal and wood. We hand draw the pattern on the metal with soapstone and cut it with a hand held plasma cutter. We then hand hammer and weld it into shape. 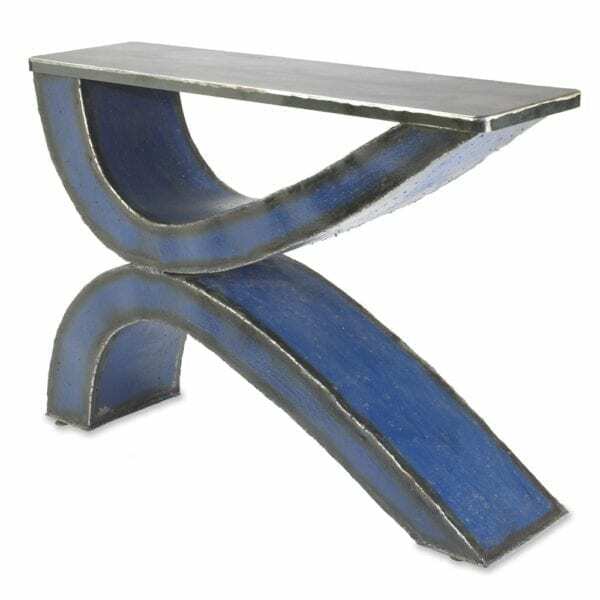 The blue was hand painted with milk paint. 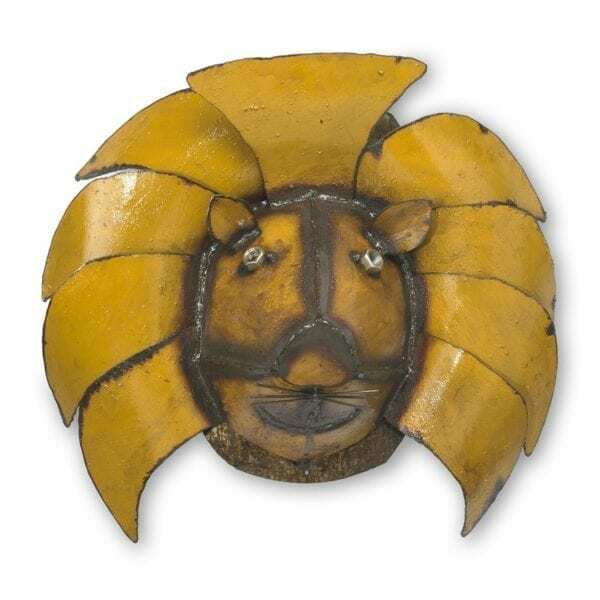 We created this Lion Head with reclaimed metal. We hand draw the pattern on the metal with soapstone and cut it with a hand held plasma cutter. We then hand hammer and weld it into shape. The yellow was hand painted with milk paint. Bring home a real trophy. 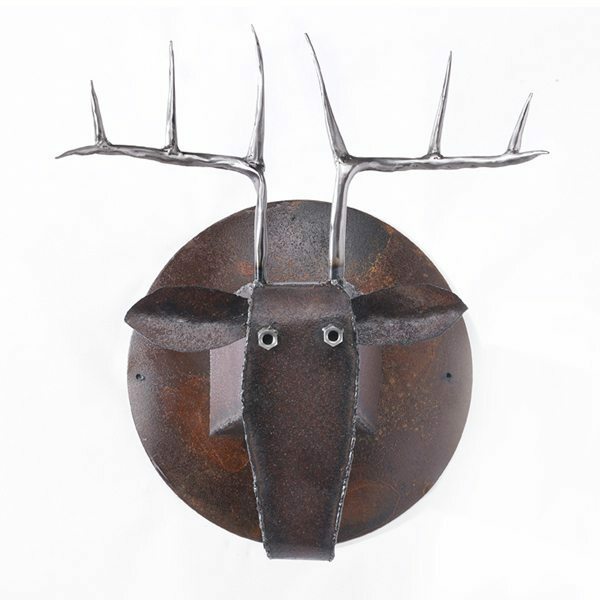 We created this Deer Head entirely from reclaimed metal. We hand draw the pattern on the metal with soapstone and cut it with a hand held plasma cutter. We then hand hammer and weld the head into shape. 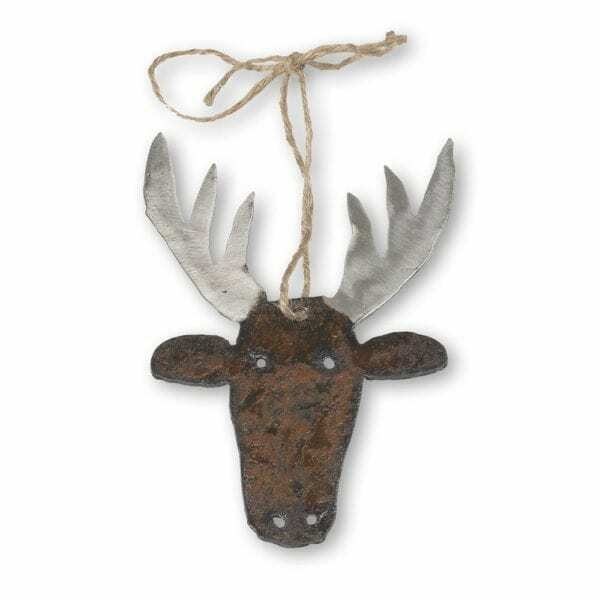 The antlers start out as flat pieces of rusty metal, we hand hammer them into shape and grind them smooth. They are made shiny with a hand held grinder. Finally, we attach it to a reclaimed corn planter disk. 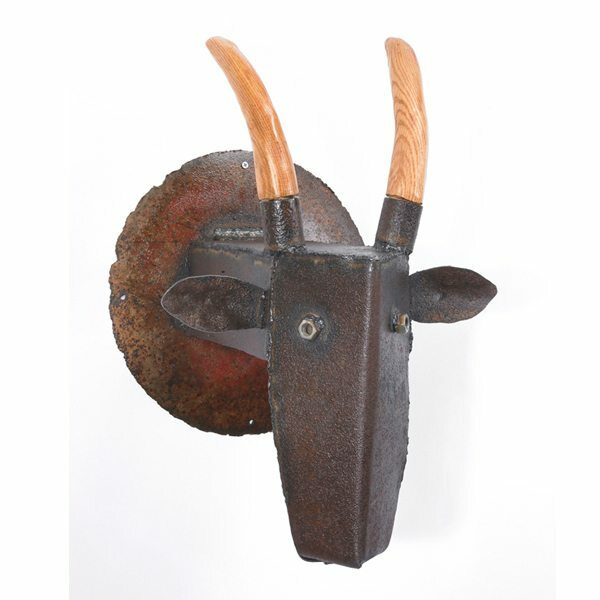 We made this charismatic goat head with reclaimed metal and wood. We hand draw the pattern on the metal with soapstone and cut it with a hand held plasma cutter. We then hand hammer and weld the head into shape. Finally, we attach it to a reclaimed corn planter disk. We cut the horns from a large block of wood and shape them by hand. 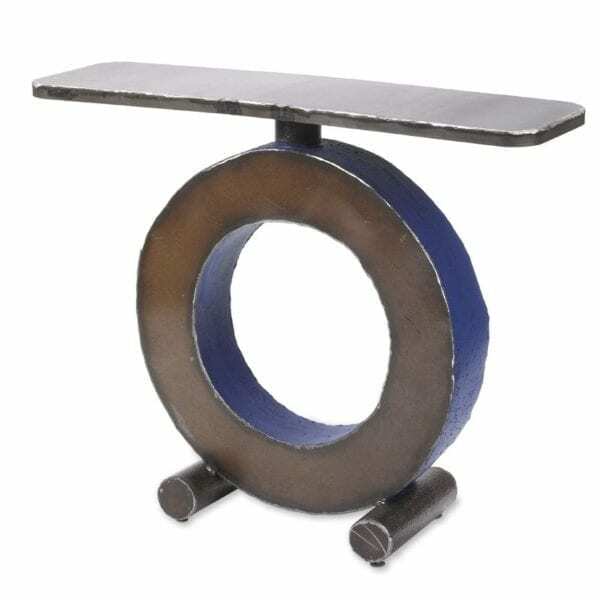 This piece is made with reclaimed steel. We hand draw the pattern on the metal with soapstone and cut it with a hand held plasma cutter. We then hand hammer and weld it into shape. 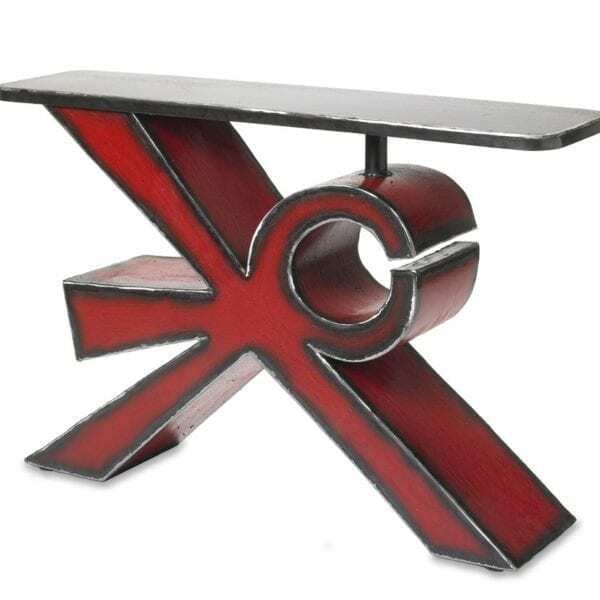 The red was hand painted with milk paint. 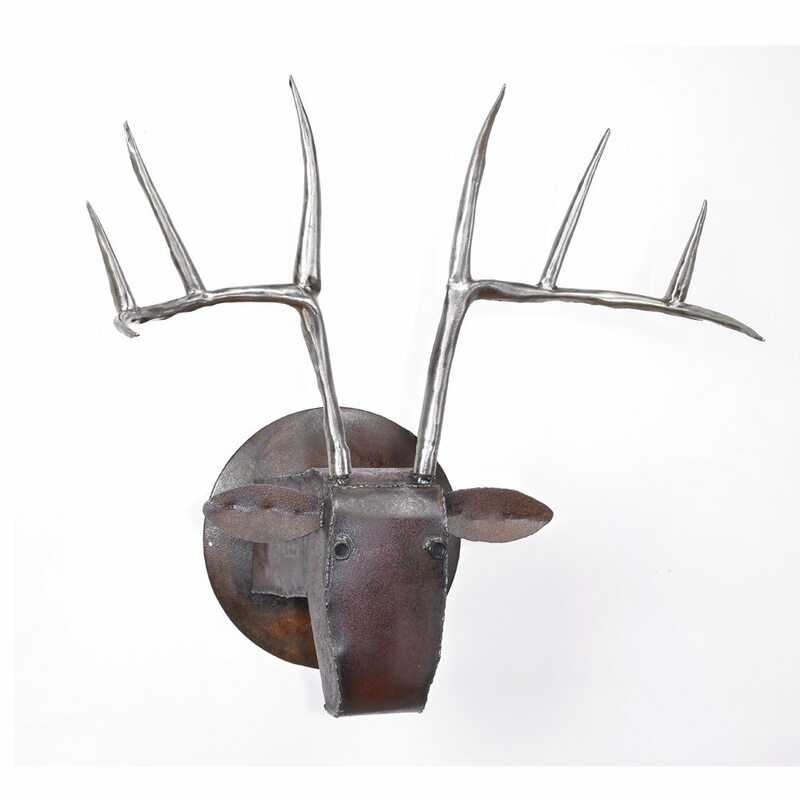 We created this Elk head sculpture with reclaimed metal. We hand draw the pattern on the metal with soapstone and cut it with a hand held plasma cutter. The antlers start out as flat pieces of rusty metal. We hand hammer them into shape and grind them smooth. Finally we mount the head on a recycled corn planter disk. 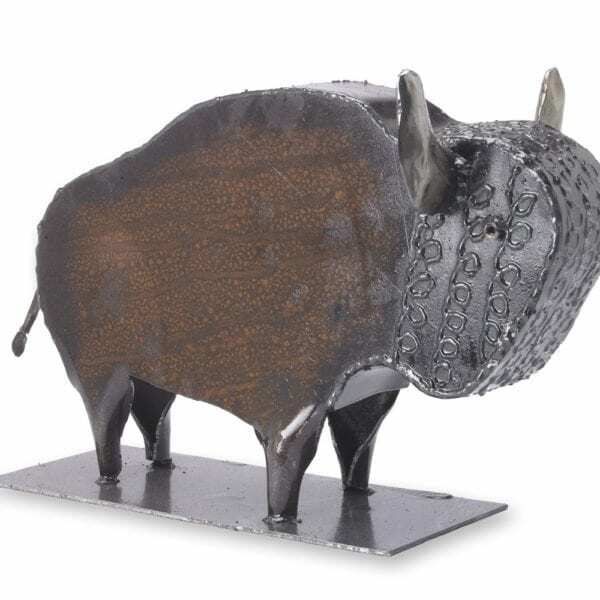 This Elephant head sculpture is created with reclaimed metal. The pattern is hand drawn on the metal with soapstone and cut with a hand held plasma cutter. The Elephant is then hand hammered and welded into shape. 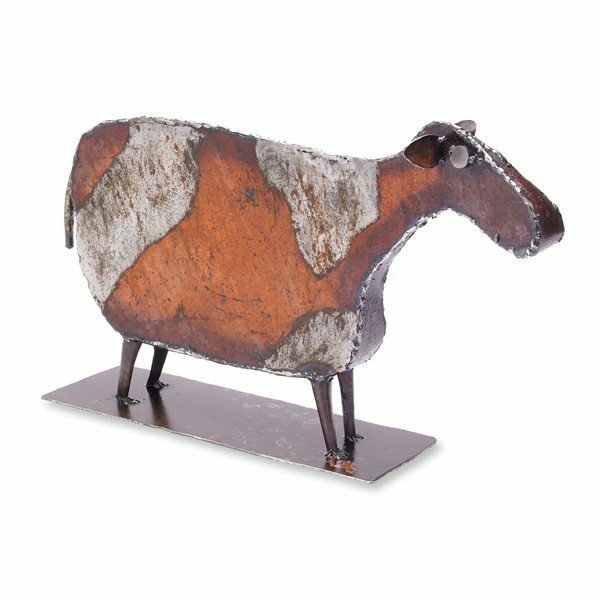 We created this cow over the moon sculpture with reclaimed metal. We hand draw the pattern on the metal with soapstone and cut it with a hand held plasma cutter. 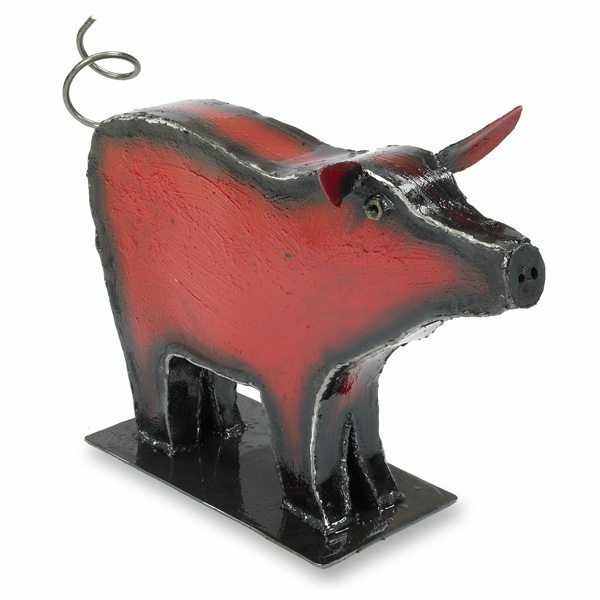 We then hand hammer and arc weld the cow into shape. It is hand painted with milk paint. These lovely EAT Letters can be used in many creative ways. 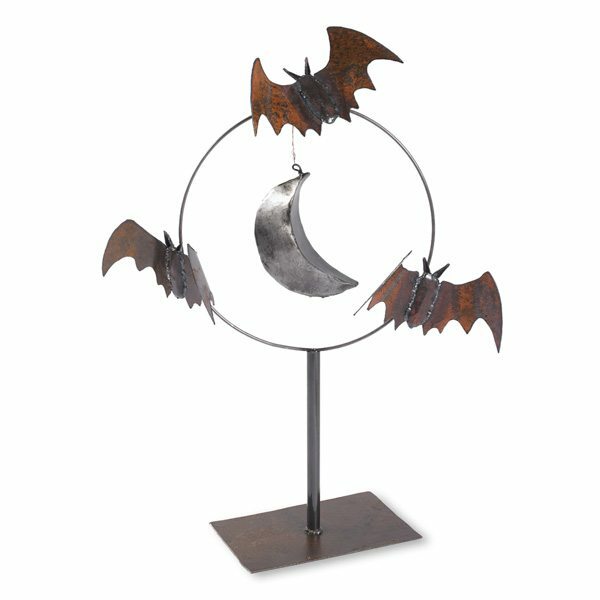 They are made with reclaimed metal. The pattern is hand drawn on the metal with soapstone and cut with a hand held plasma cutter. 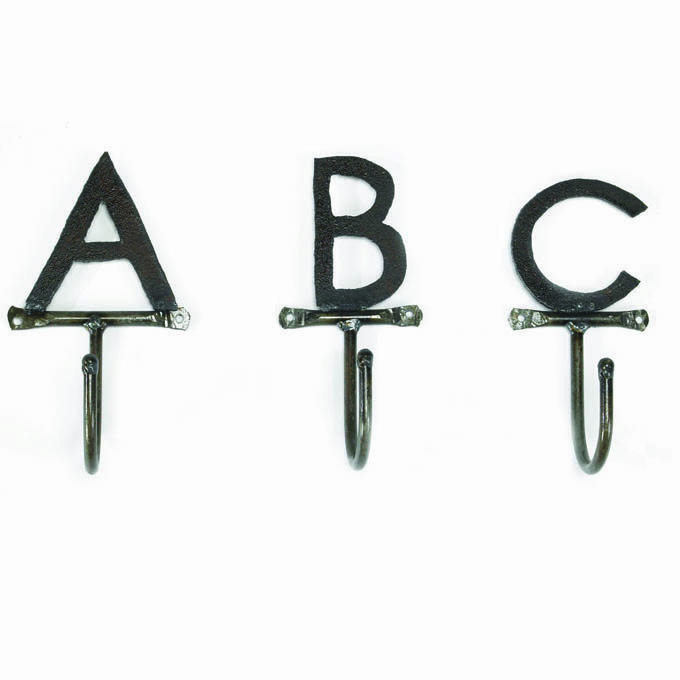 The metal is sealed so you can hang these letters inside or out. It is easy to hang with either a nail or screw. 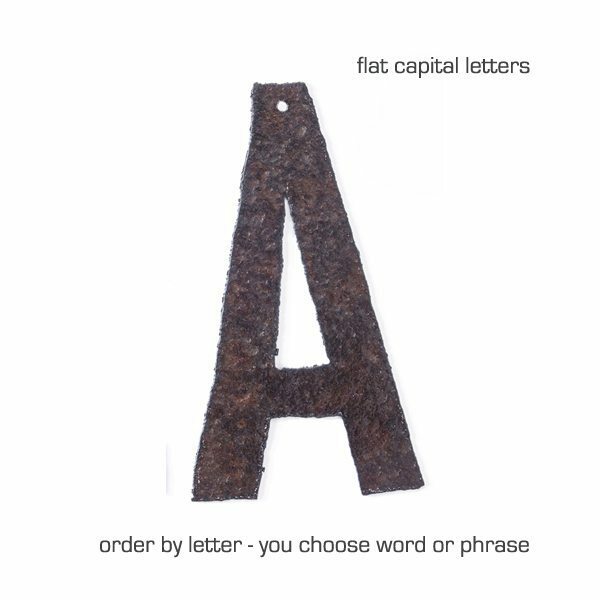 Each letters will have very subtle variations. They are cut by hand and each piece of rusty metal has slight color differences. We can make these style letters in custom words and phrases. Please see our custom typography for that option. 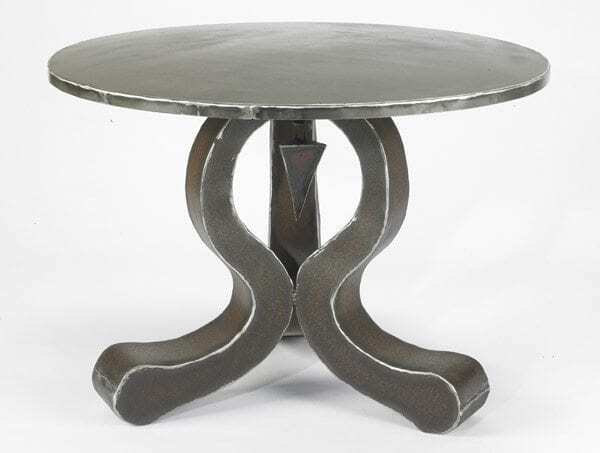 We created this table by hand hammering flat metal into shape and welding it together. We cut out the circle shape and hammer it into form. We then hang a recycled piece of chain from a harvesting machine in the middle, and hand paint the circle with blue milk paint. 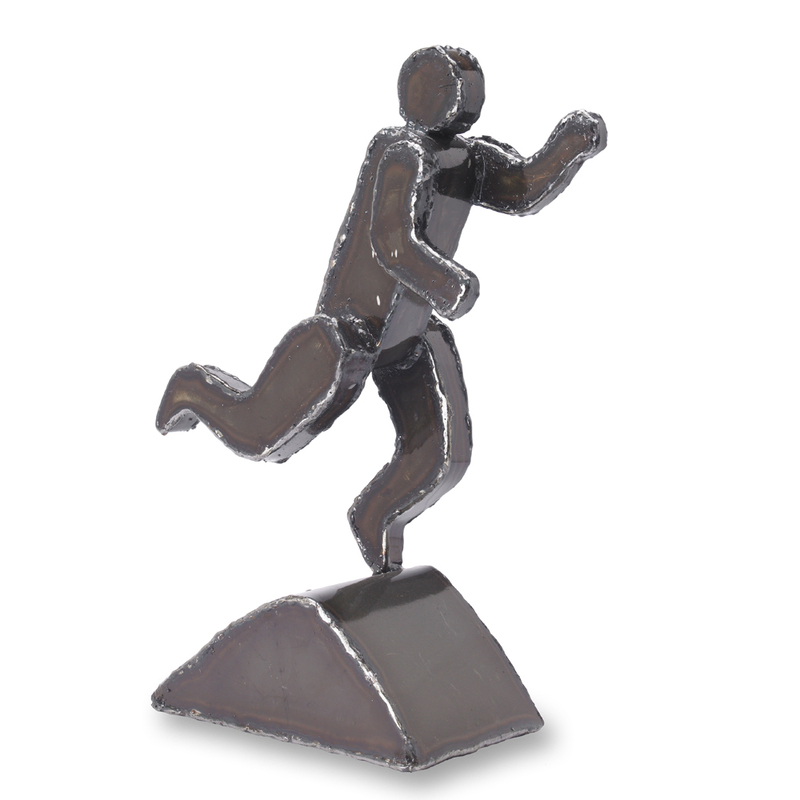 We make the top with a new piece of US made 10 gauge steel. 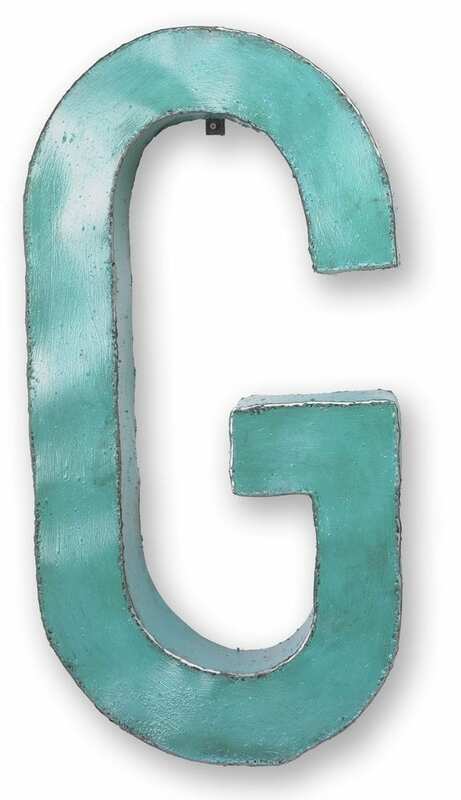 We created these letters as a statement piece that can be used in many creative ways. 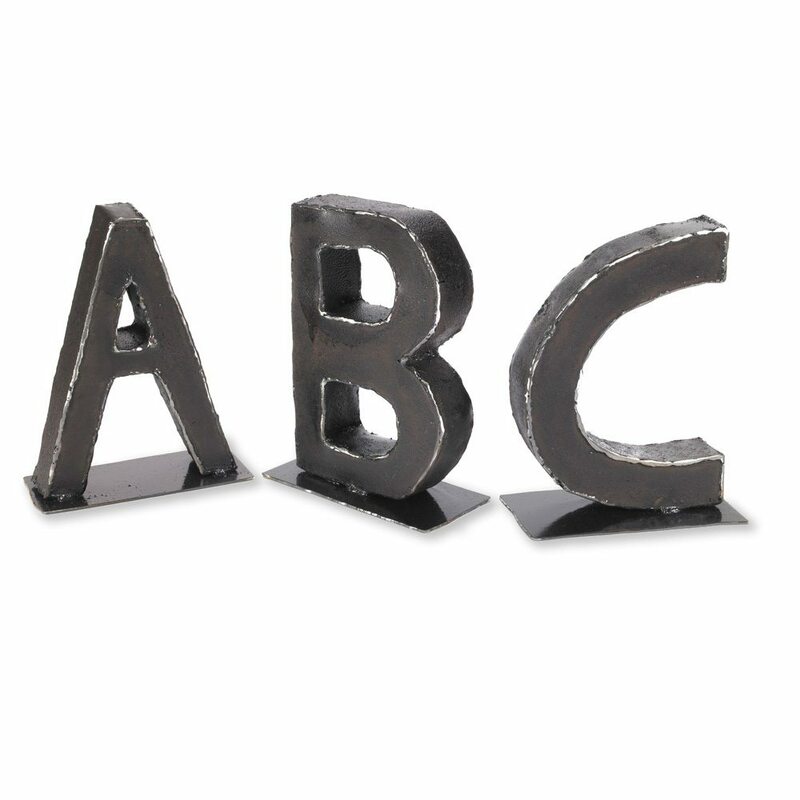 Whether for the living room or office, these letters will add a bit of personality to the room. 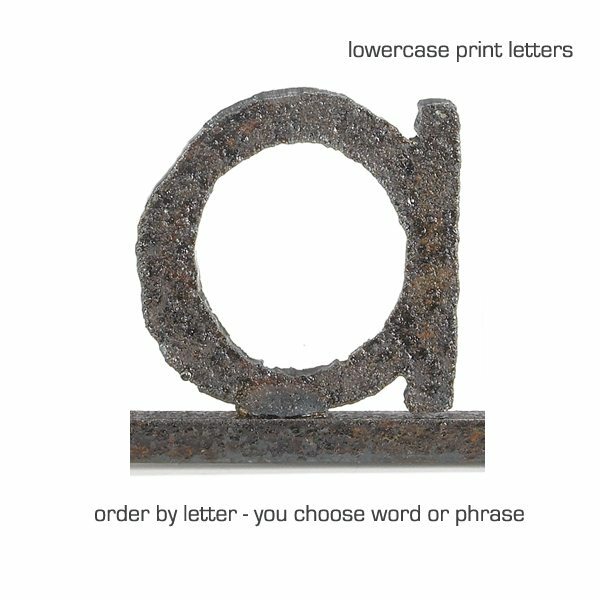 These wonderful letters may be the perfect gift for a birthday, anniversary, or any other significant time of year! 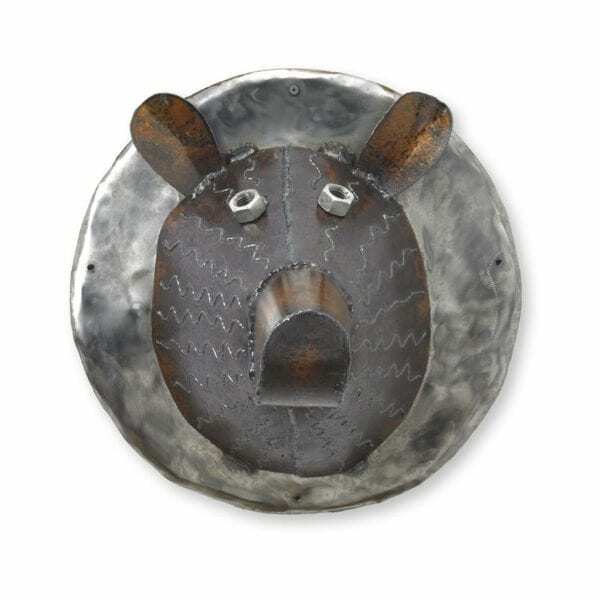 This Bear Head sculpture is handmade in Pennsylvania from reclaimed metal. The pattern is hand drawn on the metal with soapstone and cut with a hand held plasma cutter. The Bear is then hand hammered and arc welded into shape. This head can easily be hung with a nail or screw. It weighs approximately 10lbs. 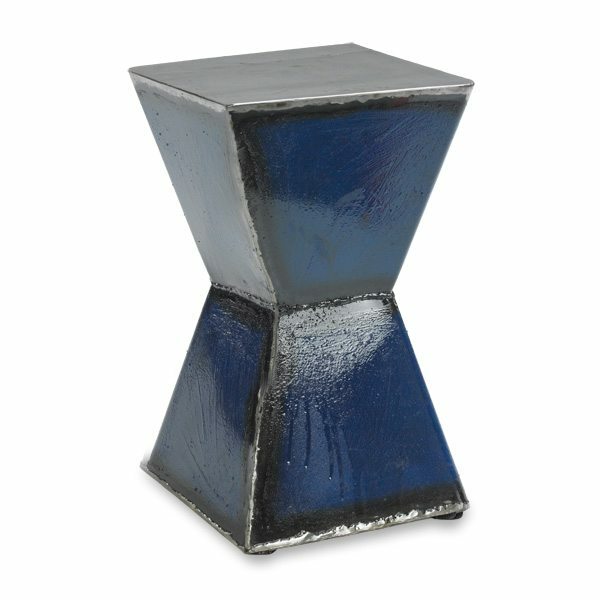 Modern lines blend with a rich agricultural history in this statement end table. The metal is from an angle iron John Deere Disk that was horse drawn (the final photo shows this piece in it's raw form). We rescued the wooden beams from an old Pennsylvania barn before demolition. We sawed them into pieces and sanded them down to shape. We cut and shaped a piece of recycled steel into place. Then applied a clear coating to the entire table for a shiny finish. 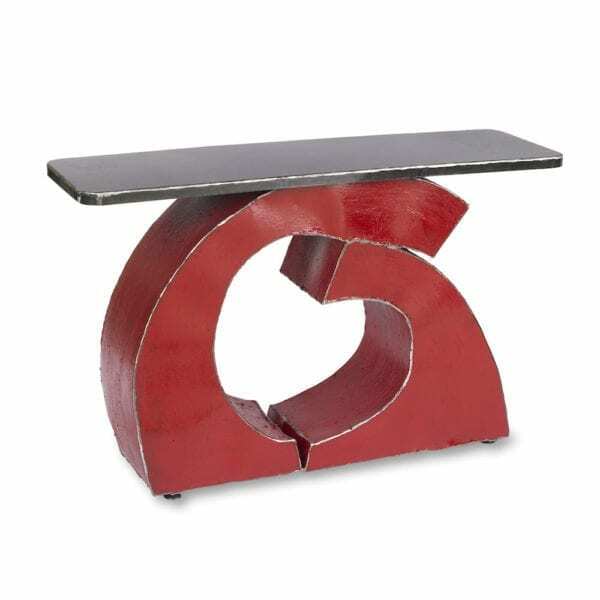 Inspire your home with this statement piece- a console, entry or sofa table made with reclaimed steel. The colors on this table are hand-painted with milk paint. 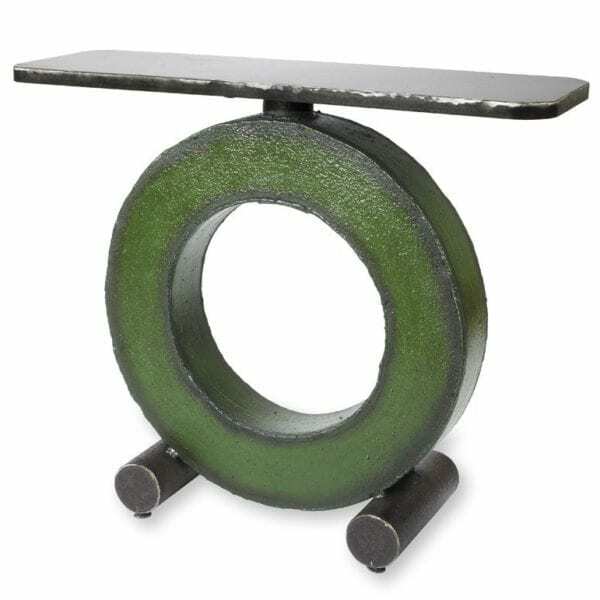 Each table features a piece of recycled steel that was hand rolled and welded to form the base, with a new piece of US made 10 gauge steel top. A clear coating was applied to the entire table for a shiny finish. size: 33”h x 42”w x 14”d Care: Wipe clean with a damp cloth. If outdoors, you can maintain a shiny metal look (optional) by applying a clear metal enamel, available in a spray can at your local hardware store.